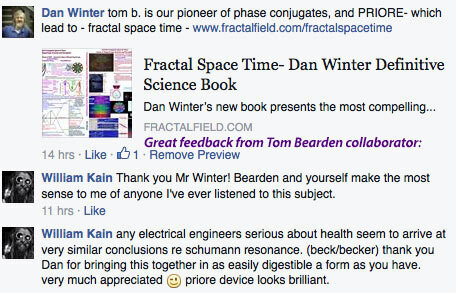 New Direct link to Shopping Cart- to order Fractal Space time- new book - color printed covers- from Dan Winter. 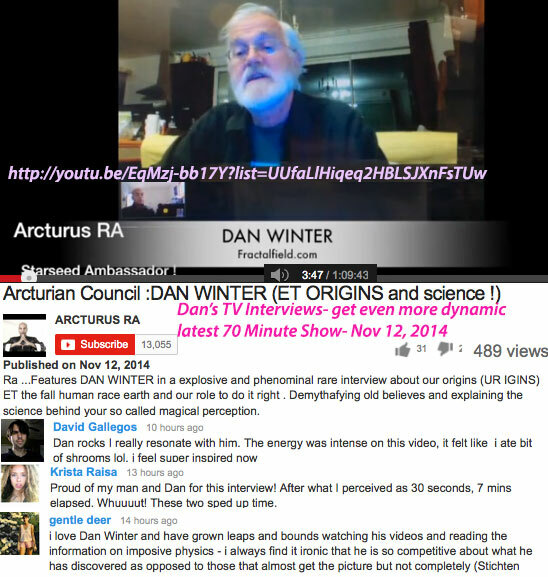 Major Breakthru on the Physics: Dan Winter's PHASE CONJUGATE/FRACTAL CAUSE OF GRAVITY Electromagnetics gets New High Level Proof/ Equation from Mark Rohrbaugh: The Charge ARC (THE Gravity!) Which Embeds the Proton IN the ELECTRON IS CONJUGATE! History & Physics of FIRE IN THE BLOOD! 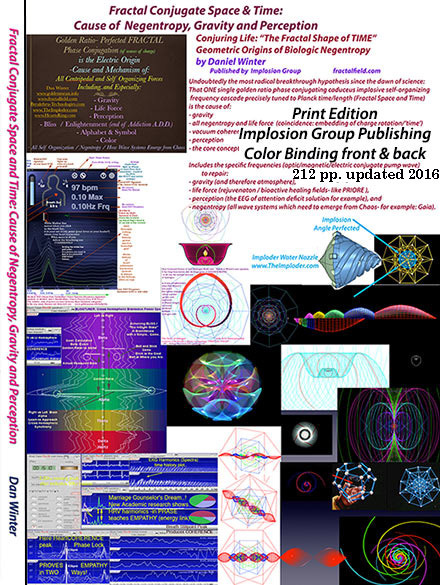 Main - Implosion Group / Dan Winter index: goldenmean.info , Origins of Negentropy Project intro(below). Abstract: We have extensive evidence/literature now that negentropy / self-organization in (biologic) electric field generation (like blood)- is extensively related to the well known self organizing quality of phase conjugation (originally optical- now we are learning about phase conjugate dielectrics and magnetics). 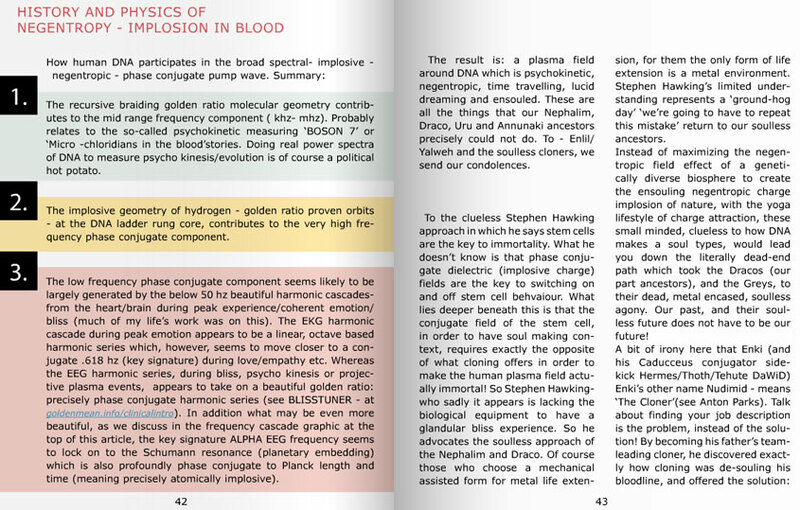 All of these phenomenon are potentially present in blood- particularly in the presence of recursive implosive DNA braiding associated with human peak experience / bliss / kundalini. The coherent lo frequencies from EKG /EEG- entrained also with the known sacral cranial spine liquid pump lo frequency 'tidal' harmonics - These are the phase conjugate pump wave- we can well understand- create negentropy- for blood and glands. Dr Tom Dooley- proving disease organisms die quickly in his blood -might be an example. What evidence do we have - that the negentropic / conjugate 'implosive' component of field effect IS precisely what we call conscious - and self aware? When we read pervasive stories about ball lightening responding to telepathy just like dogs and horses do- we are compelled to wonder. Is the core component of the toroidal ball lightening which is like a conjugating pump wave- exactly what makes it respond to 'awareness'? Is this the initiating threaded spider web to mindfullness? It becomes also then obvious that the peak of intelligence is also the peak of the centripetal (conjugate) wave force which MAKES the field around the brain - and around conscious intention - ELECTRICALLY CENTRIPETAL (as Tiller so carefully measured). So then to me it would stand to reason- that the actual power of consciousness - and evolution of 'intelligence' would be simply measureable by HOW centripetal was the (conjugate) field you create with your mind - the so called 'flame in the mind'. (See below how the correct sequence of Hebrew letters - in the 4 direction- square pump wave- identify the centripetal moment which creates the 'spell' in Ophanim ritual). This means that the self awareness of the Sun - which every Shaman will tell you is capable of profound conversation- is precisely the component of it's field which by generating fusion- is in fact generating (the self organizing field -we call) AWARENESS. This would in part also explain that (conjugating?) capacitive charge distribution efficiency - as Korotkov's GDV in air- showed- correcly measures where Shaman can go to make survival critical phone calls to ancestor voices and memory. 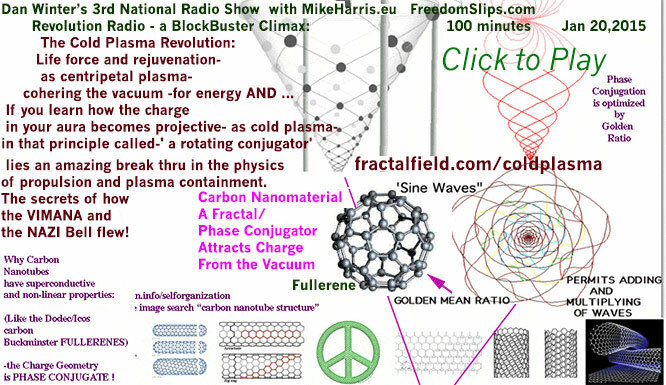 This means that the component of the Earth's field effect which is generating negentropy - by being conjugate (read Bill's hypothesis that the famous "Smoky God" - inner core of the "hollow Earth"- is in fact a warmth releasing nickle cold fusion reaction) - IS in fact the core component of what makes the Earth appear electrically self-organizing. This would be exactly the frequency signature and symmetry operation of precisely WHO is GAIA! - can make DNA implosive / firey - negentropic and ultimately regenerative (immortal). Note here also how I discovered this exact same lo frequency signature harmonic cascade identifies the magnetics applied in BOTH the Priore device (healed thousands of cancers - docs below)- AND Elizabeth Rauscher's successful FDA trials- pain reduction by magnetics! 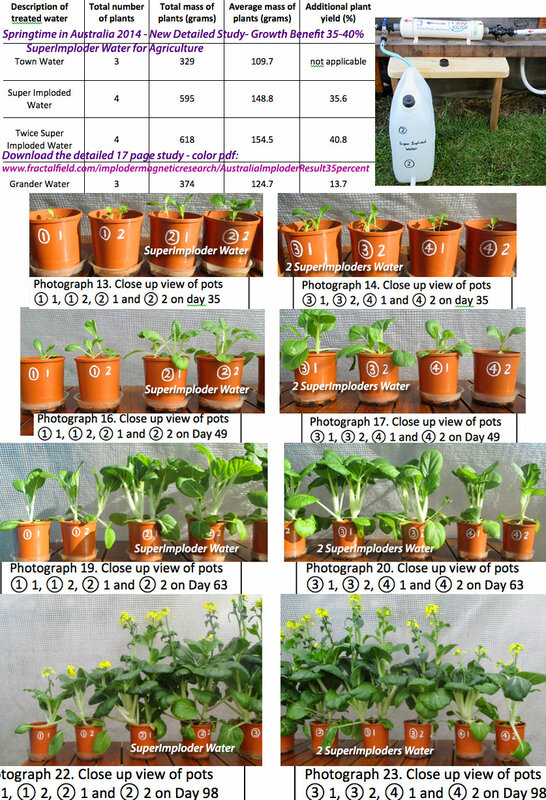 +which predicts the exact 2 frequencies which ONLY motorize PHOTOSYNTHESIS! +which then predicts the EXACT frequency series used to heal thousands of cancers by the PRIORE SYSTEM (who also did not know the equation). IS QUITE LITERALLY THE FLAME OF MIND! 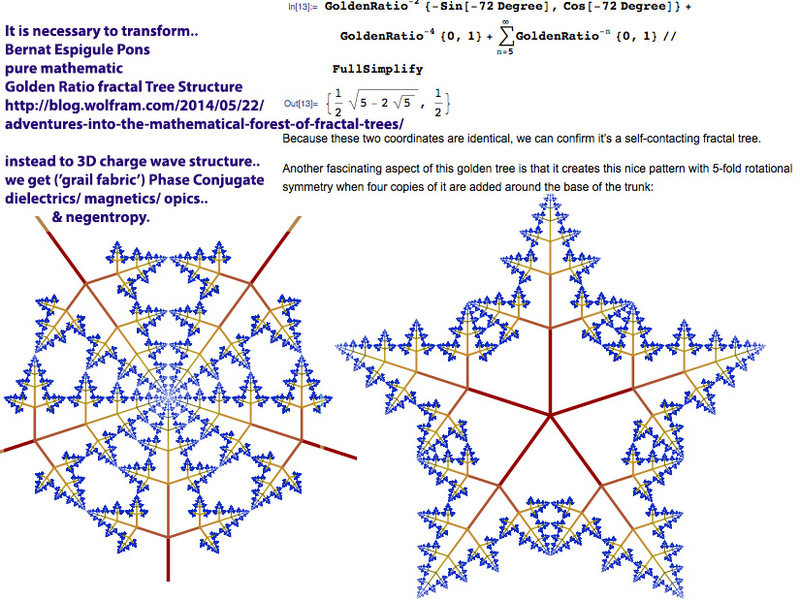 Below - using Mathematica - to model the perfect 2D Fractal Tree Structure based on Golden Ratio.. The power of the synapse is its ability to average and summate the number of arriving capacitance waves from axon to dentrite. The moment of firing is triggered if a critical mass of waves arrive in summation there follows a period then when firing is not possible. 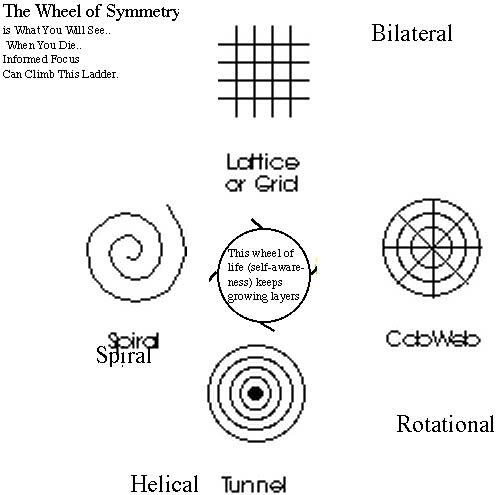 - In just the same way sacral cranial physics well known to Upledger Institute teaching WHEN these same sacral cranial liquid harmonics GO (phase conjugate) to a still point (literally- moment of stillness..) THIS is the climax healing crisis..
it is rather the negentropic SOURCE of biologic coherence in general! 1. At the well documented negentropic center of phase conjugate optics- coherence increases- (the only waves which cancel are those out of phase ). are all measureable electrically negentropic.. 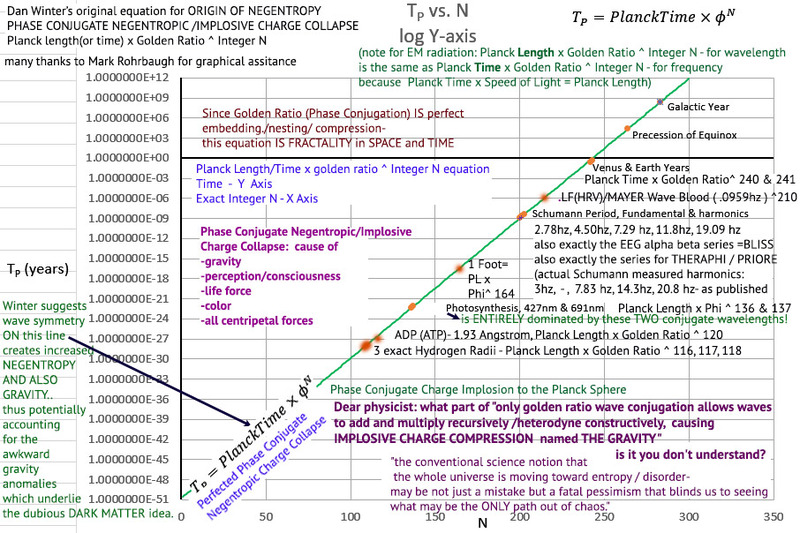 Turns out what identifies the wave mechanics of each one is golden ratio phase conjugation to planck dimension! 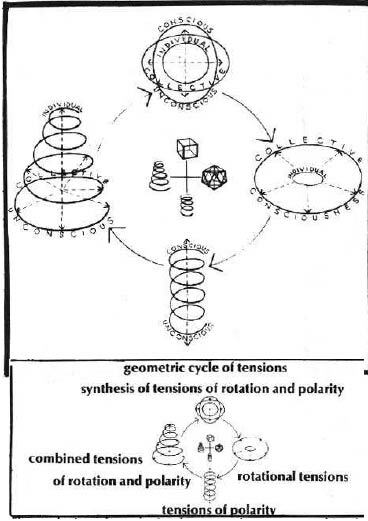 The process of pushing the aura central charge seed (KA BA)- during death or coherent lucid dream involves a highly specific and known sequence of geometric phase transformations- documented as the 'Kluver Form Constants' (images below). This then suggests a very specific electrical environment for successful death/birth -the prefect squeeze - enabling plasma distribution- the bed- the place- the magnetic map. As the Hopi and the Cherokee knew- the graveyard must be a plasma map- library card to survival critical ancestral memory as sustainable field effect. 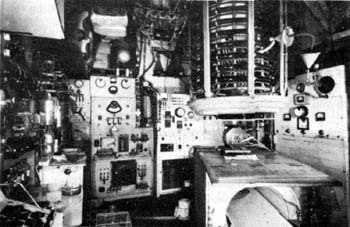 Korotkov pioneered how to measure the fractal charge distributed AIR- where phone calls to ancestors are enabled. Hints from the 'altar' or shem at Machu Pichu. (Generally opposite of the obscene electrosmog of a modern hospital). 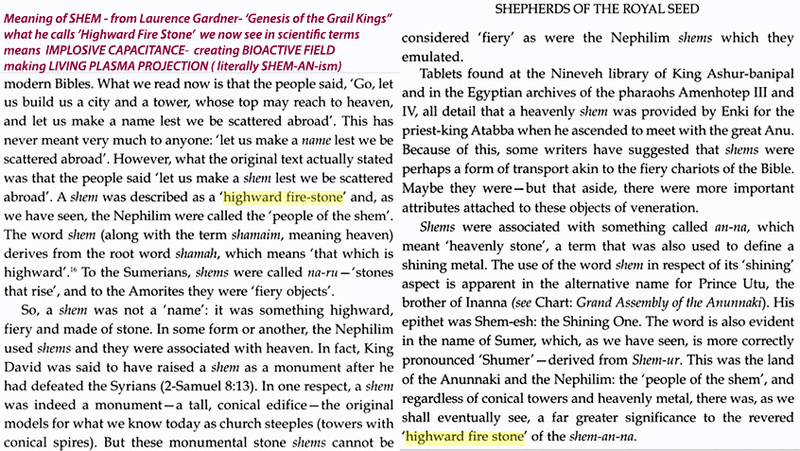 In fact the ancient SHEM unto the Lord- Biblically mistranslated as ALTAR in church- is a phase conjugate dielectric bioactive field plasma projector stone or crystal- not only door to electrically successful death/birth. It is no coincidence that the so called Sacred Ark - could non-destructively contain radioactive material- which we now know is an electrical quality of perfected conjugate compression EXACTLY like the same measureable quality of focused human attention. 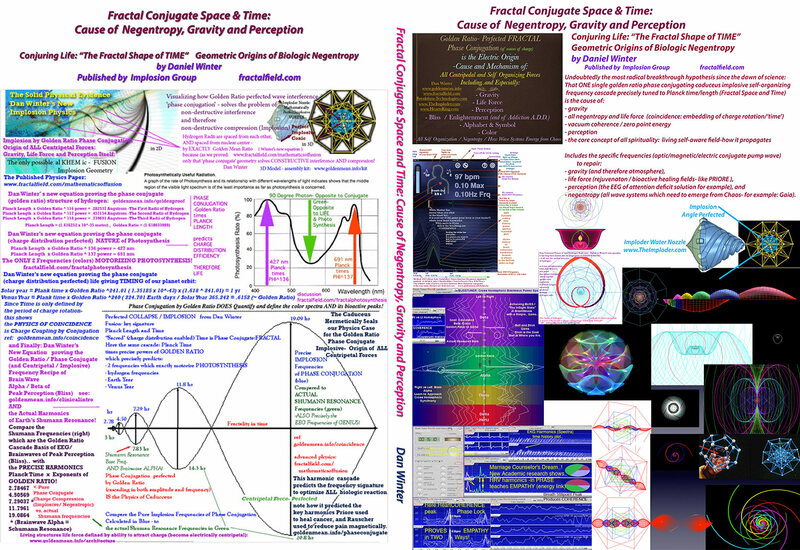 ALL of which is part of understanding the fractal / conjugate / implosive and negentropic ORIGIN in general of all centripetal forces... (the gravity, life force, perception).. which include the wave mechanics of successful death." machinery to the very wheelwork of nature." examined and modified; it will always be full of mysteries and surprises." "What would happen if and when all this stuff eventually gets used in a civilization? After all, this society is scarcely above slightly organized barbarism. So let’s reverse the polarity on the wayback machine and take a peek into the future. Let’s set the year for say, 2491, and see the world through the eyes of a citizen of that time." -Bill Donavan , from his classic book "Glimpses of Epiphany"
"The extraction of energy directly from space has been sugested as a viable process for the solution of the enrgy problems of society"
"There is a persistent urban legend about Nikola Tesla, the prolific Serbian inventor. According to some contemporaries, he developed an electric car in the 1930s. He converted a Pierce Arrow car removing its tailpipe. He claimed that his greatest achievement was not alternating current or the radio, but a high voltage tube, which could produce energy and transmute materials. This story has usually been dismissed as nonsense. Now in the light of emerging LENR (Low Energy Nucler Reactions/aka Cold Fusion) experience, this could have been true after all. He claimed “nature has stored up in the universe infinite energy,” (Columbia College Lecture, N.Y. May 20, 1891). View interview with Winter and Donavan here talking about what they are going to talk about! 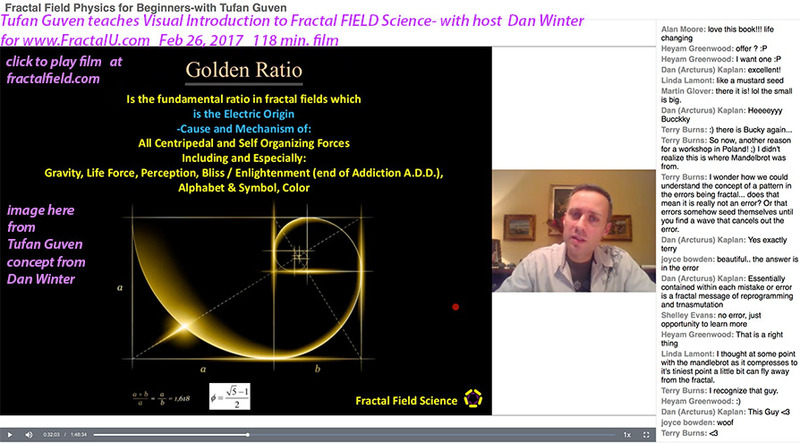 Winter/Donavan webinar via France: Applied Sacred Geometry: New Energy Systems, innovations and Physics. 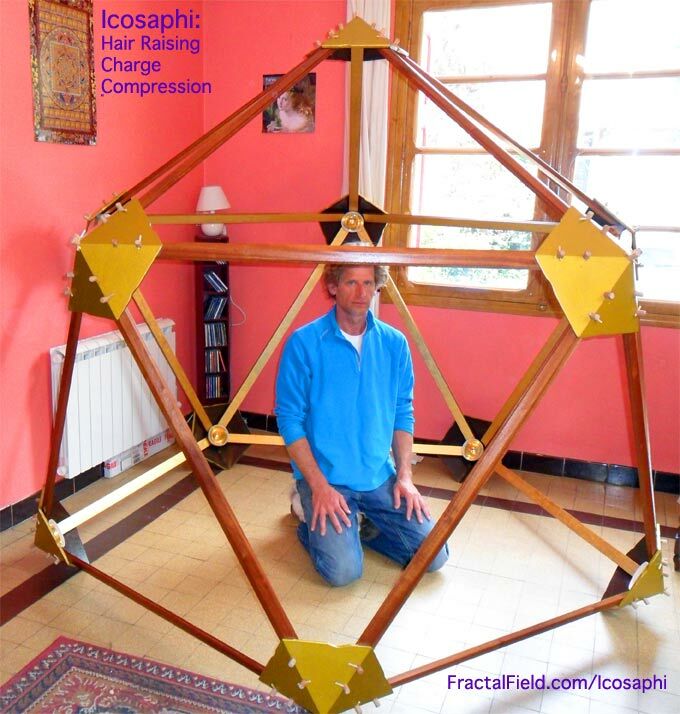 Thinking outside the "BOX" Discover in this webinar, why golden ratio is the wave solution to constructive compression implosion, phase conjugation, negentropy- and therefore life force, perception, and consciousness. Perhaps the secret to tap the vacuum? Because a fractal signifies infinite compression, it is what spans the gap between the symmetries of the very small and the very large. Fractals exhibit self-similarity, meaning their inner structure has the same pattern as their outer structure (like a pine cone or a fern tree). Just as fractality describes the geometry of waves of energy or charge, fractals manifest as wave patterns that evolve ad infinitum – like an encoded thread linking larger spirals to infinitely smaller ones. 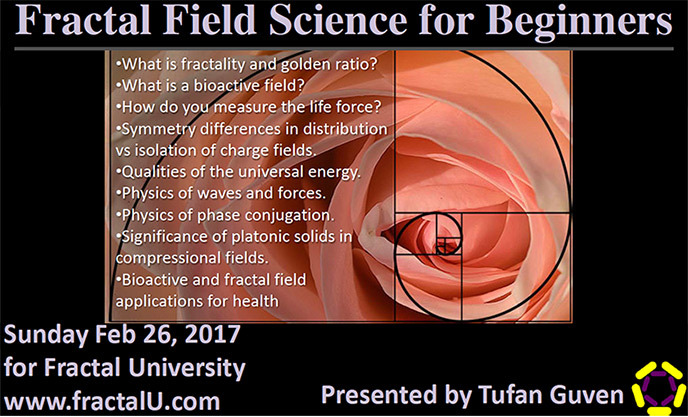 The Fractal Field Unified Theory and the principle of the Golden Mean allow for the addition and multiplication of waves of charge and energy. The idea of symmetry is vital to both. Quantum physicists can explain the menagerie of fundamental particles we observe – quarks, gluons, fermions, bosons and more – as different facets of a symmetrical object. Relativity, too, is an expression of the symmetries that exist between space and time (Einstein's famous equation E=mc2 articulates a symmetry between mass and energy). Symmetry is part of the language of nature, from the molecular level on up: Many animals and plants exploit symmetrical shapes as a way of standing out against the chaos of their landscape. DISCOVER THE SOLUTIONS TO THE GROWING ENERGY AND ENVIRONMENTAL NEEDS OF OUR PLANET- and get involved! A rich understanding of the fundamentals of the universe is at the heart of these sophisticated, sustainable technologies. 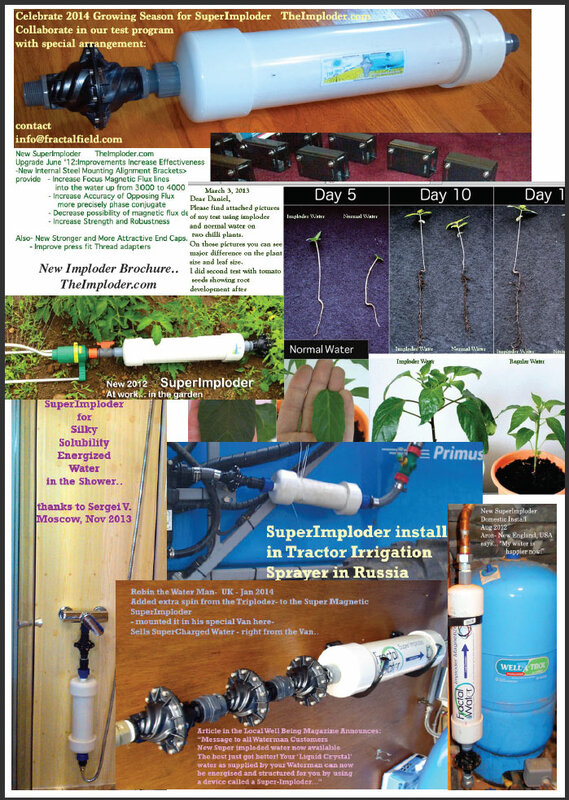 If you’re passionate about innovations in energy production systems, sustainability and agriculture, health and education, and interested in being part of the solutions- not the problems, then the www.Breakthru-Technologies.com is the place to be. We represent a brilliant international team of cutting edge scientists and investors, all committed to effective change and a vision of a better world. 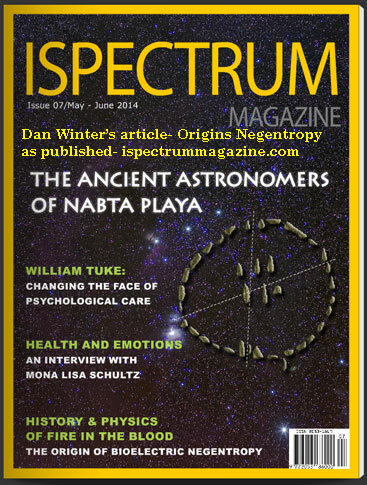 Featuring Scott Olsen Ph.D, Robert Lawlor (Aust. ), Mark Hanf, Steve Bass, Dorothea Rockburne, Frank Vedegys, Lance Harding Ph.D, John Lloyd, Karl Lorenzen, Dan Winter and Bill Donavan. 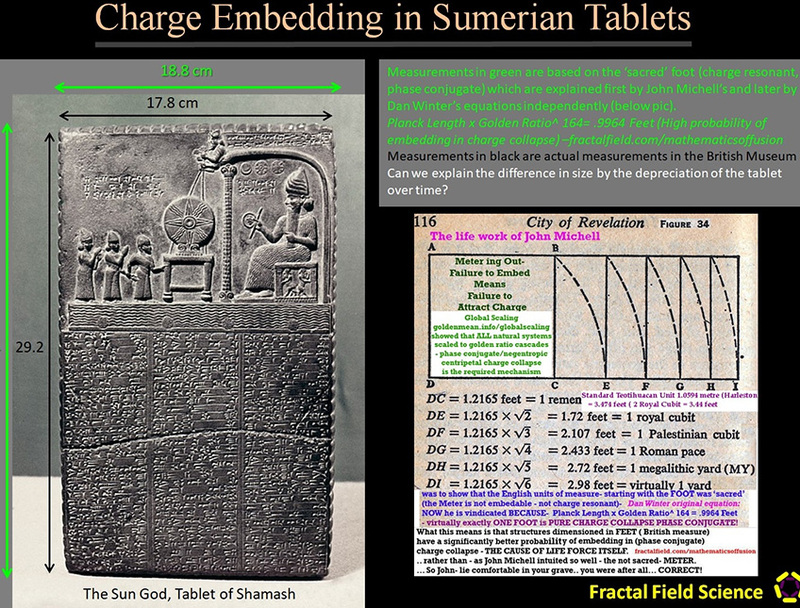 REAL BIOLOGIC HISTORIC EXAMPLE OF (AN IMMORTALIZING) NEGENTROPIC FIELD! setting off hundreds of years- rush-to be buried with him- in the Arlyscamp- literally Elysium Field..
- a real insight into our lifetime teachings of Physics of the Grail mysteries! 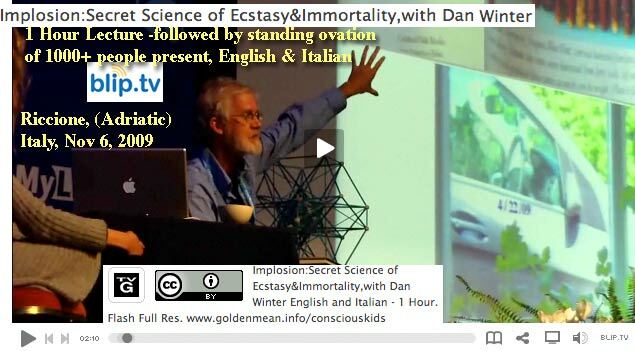 - Originally assembled with Roger Green - fengshuiseminars.com in conjunction with ongoing lectures in South France - Grail Series..
Aug 2014- New SuperImploder Results Report- We are so excited about this! sucking in it's electrical environment- to become powerful and sustainable (virtually immortal). April 6, 2014- " Hi Dan, > I hope you are fine and doing well. 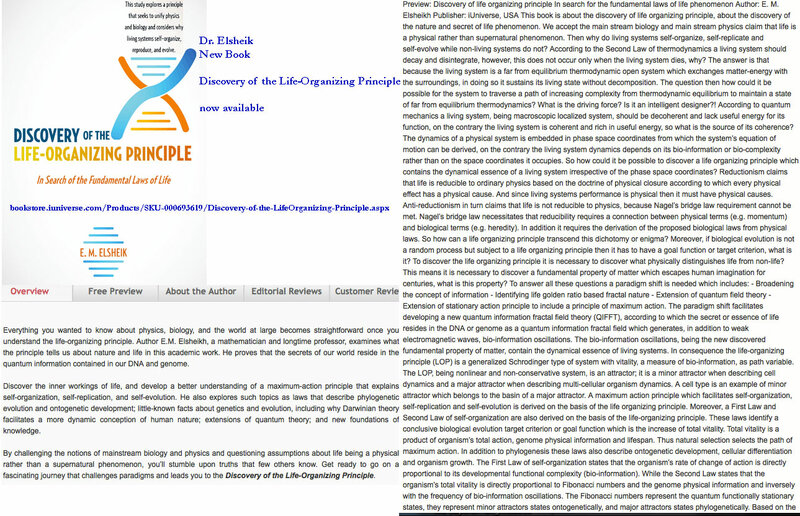 My book "Discovery of the Life-Organizing Principle - In Search of the Fundamental Laws of Life" is now available ..> I have acknowledged your collaboration and the importance of your discoveries to my work. Please find enclosed...> Kind regards > Elsheikh"
Based on magnetic cascade, which eliminates pain and speeds healing. In the 1960's and 1970's, in France Antoine Priore built and tested electromagnetic healing machines of startling effectiveness. In hundreds and hundreds of rigorous tests with laboratory animals, Priore's machine cured a wide variety of the most difficult kinds of terminal, fatal diseases known today. However- the technology was then supressed ! Time to now get it back into society. We are very passionate about this and are seeking investors. The stock and Forex markets were a perfect environment to leverage our technology that understands oscillations in financial markets are biologically induced. By adjusting the threshold conditions to say when there are dominant harmonics present in a stock or Forex price history - the shape of the next move can be used to identify the next likely direction. Take a look at independent trades, statistics and proof of concept charts. The living wave function happens because when a million people are involved in the stock market - it is a living event, that has "emerged from chaos." It creates a pattern, an emotion, a movement, an expression, a 'predictable order' that can be measured, tested, validated and used as a tool for stock market analysis. ANY wave form that enters into implosive collapse or "compression" -has therefore become part of a self organizing system. By applying unique IP mathematics - we can powerfully look at stock analysis- in a far more subtle and sensitive manner- for the well known Golden Ratio-indicators of the moment of self-organization. Any wave shape- which is going to emerge from chaos - is going to exhibit these characteristics. All inner surfaces are gold- in phase conjugate charge geometry. Powerful centripetal charge field: will - accelerate growth, reduce radioactivity, preserve life force (food etc). To be added soon: phase conjugate MAGNETICS: pain reduction, healing acceleration. 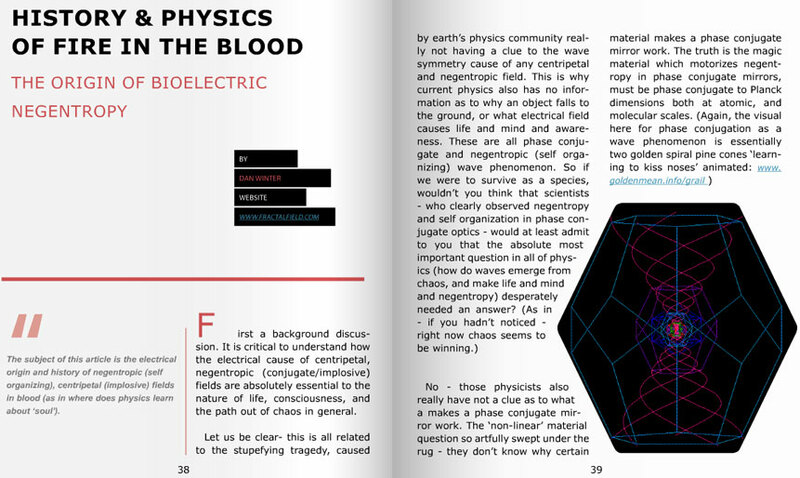 The subject of this article is the electrical origin and history of negentropic (self organizing), centripetal (implosive) fields in blood. (As in where does physics learn about 'soul'). 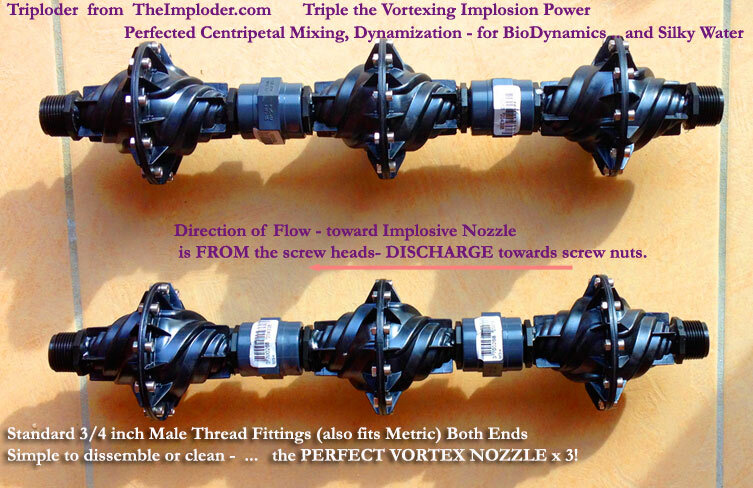 It is critical to understand how the electrical cause of centripetal, negentropic ( conjugate / implosive) fields- are absolutely essential to the nature of life, consciousness, and the path out of chaos in general. This is the same science community - ignorant of the phase conjugate wave nature of all paths out of chaos- who knowingly nod their heads when you ask them why does a bird fly south in the winter?- INSTINCT they assure you. When in fact the word instinct is merely a label for ABSOLUTE IGNORANCE. ( chaos is definitely winning in the language of science). Maybe we should ask them why the word G-ray-vity means "G -Ray of Vita" - the generative centripetal spiral wave mechanics of life itself! SO- to those who understand how to re-arrange waves so that negentropy- happens- chaos is avoided- to them belong a path alive out of history. The only alternative ultimately is Death (of their species). Note especially the phase conjugate / negentropic hygiene which is associated with taking memory thru death ( www.goldenmean.info/immortality ). To the rest- your stubborn physicist community- who smugly ignore everything we have published about implosion- we send them appropriately to their karma: chaos and oblivion. This is how you cook up life / NEGENTROPY among waves! 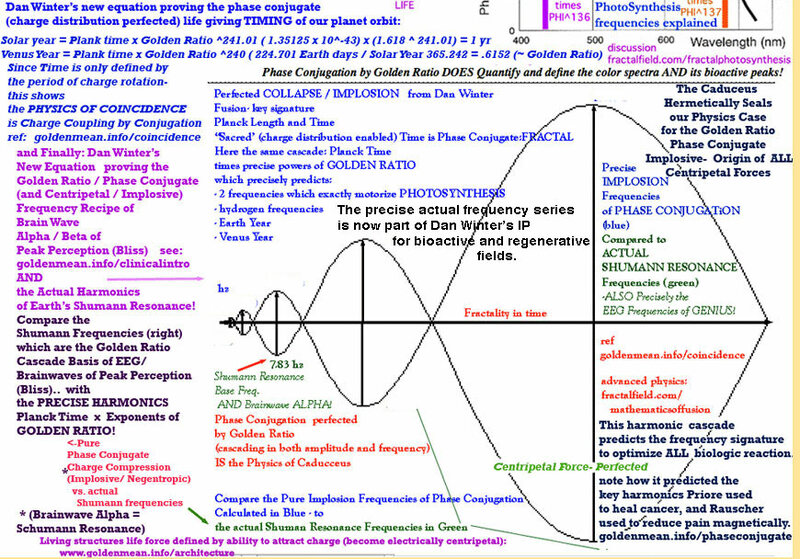 This is more than just the optical frequency recipe which obviously restores attention span to your childrens classroom .. - as in shoot those damm non-full spectrum flourescent lights will you..
- it is also the GENERALIZED wave mechanic recipe to get all of life out of chaos! So- having vented my frustration- .. actually looking at the murderous governments everywhere in the world... perhaps these tragedies are too little to mention. 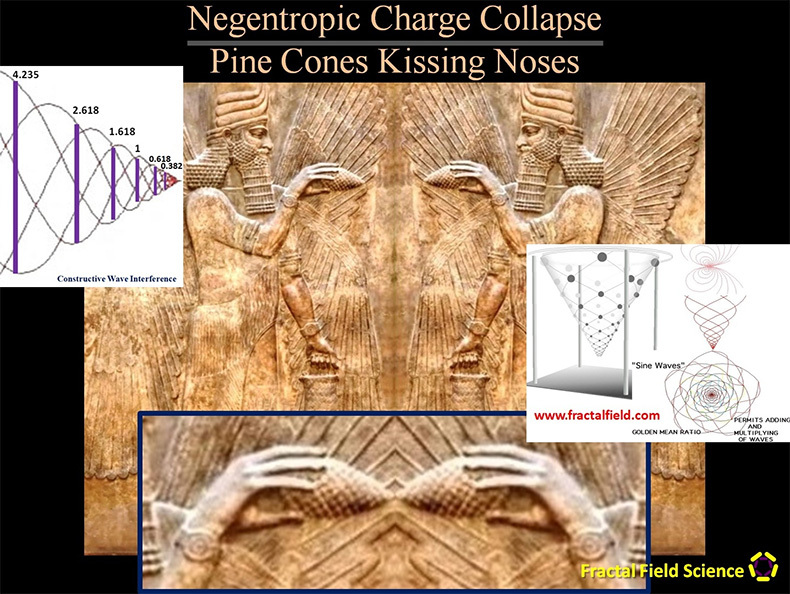 We always knew chaos was winning.. we see that locally- but perhaps.. riding a longer wave of history..
Back to my subject here.. history and physics of negentropy - implosion in blood. 1. 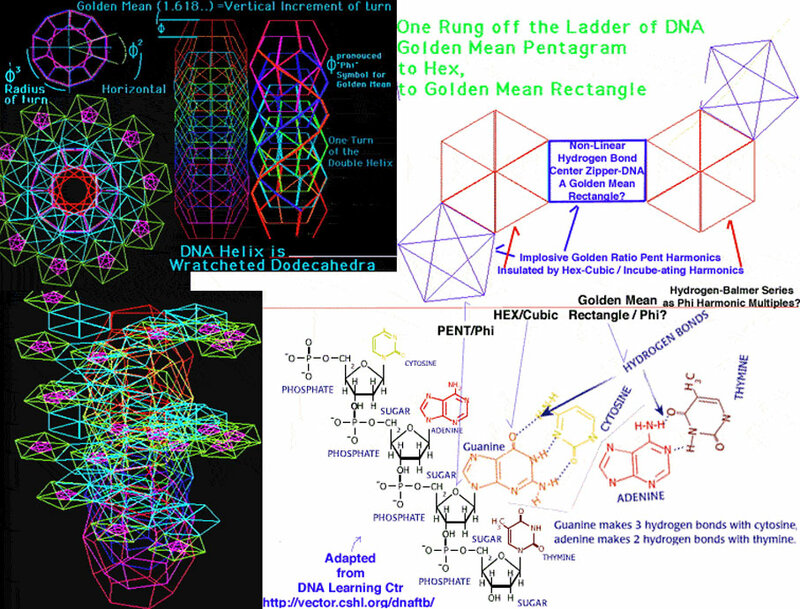 The recursive braiding golden ratio molecular geometry - contributes to the mid range frequency component ( khz- mhz) - Probably relates to the so - called psychokinetic measuring BOSON 7- or MicroChloridians in the blood stories..- doing REAL power spectra of DNA to measure psychokinesis / evolution is of course a political hot potato. 2. 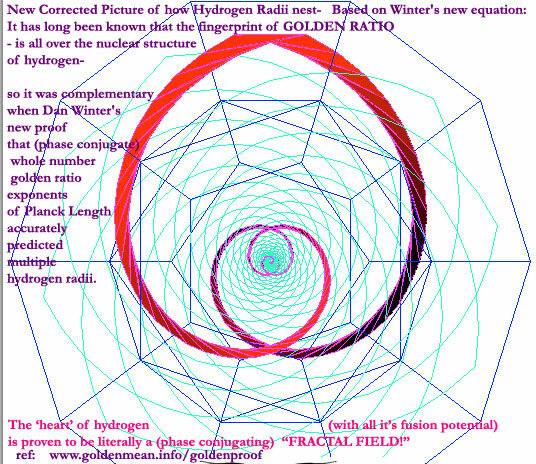 The imposive geometry of hydrogen - golden ratio proven orbits- at the DNA ladder rung core - contributes to the very hi frequency phase conjugate component. 3. 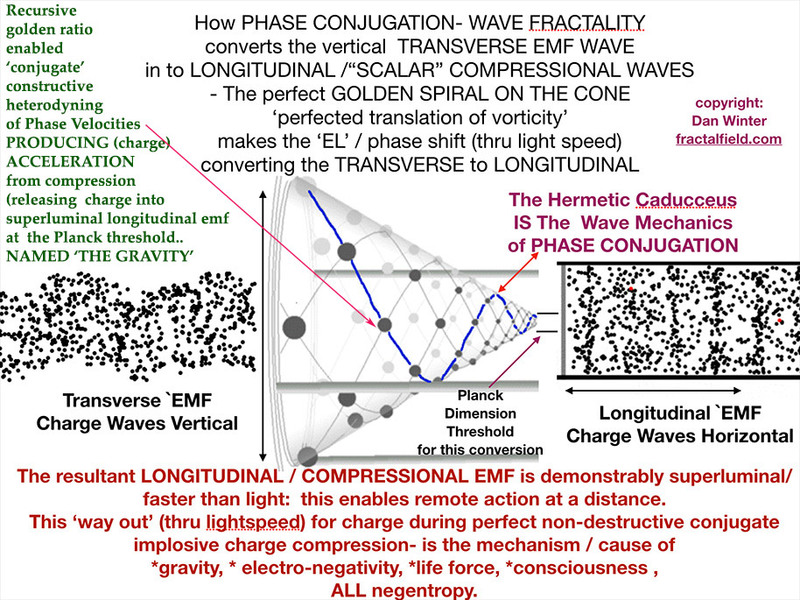 The lo frequency phase conjugate component- seems likely largely generated by the below 50 hz beautiful harmonic cascades- from the heart / brain during peak experience / coherent emotion / bliss (much of my lifes work was on this). The EKG harmonic cascade during peak emotion appears to be a linear - octave based harmonic series - which however - seems to move closer to a conjugate .618 hz - key signature- during love / empathy etc. WHEREAS the EEG harmonic series - during bliss / psychokinesis- projective plasma events- appears to take on beautiful golden ratio- precisely phase conjugate harmonic series (see BLISSTUNER - again at goldenmean.info/clinicalintro ). 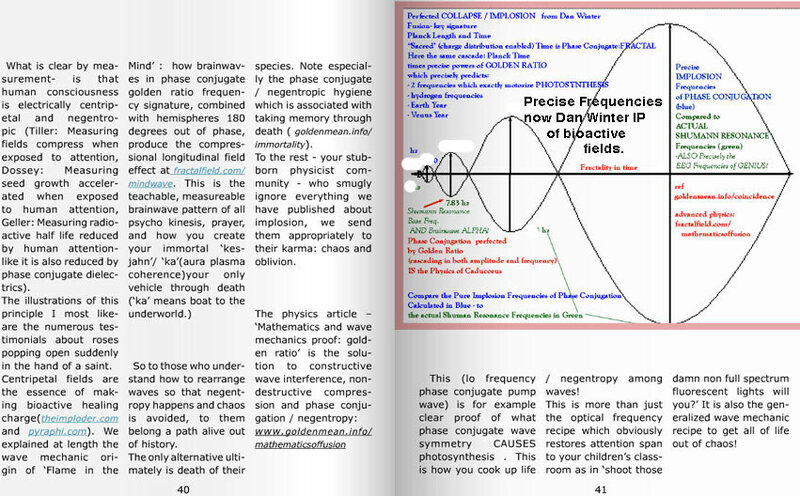 And what may be even more beautiful - as we discuss in the frequency cascade graphic at the top of this article- the KEY signature ALPHA EEG frequency - seems to lock on to the Schumann resonance - planetary embedding - which is also profoundly phase conjugate to PLANCK length -and time (meaning precisely atomically implosive). the clueless- Stephen Hawking approach: he says: STEM CELLS are the key to immortality. What he doesn't know is that phase conjugate dielectric (implosive charge) fields- are the key to switching on and off- stem cell behavior. What lies deeper beneath this- is that the conjugate field of the stem cell- in order to have soul making context- requires- EXACTLY THE OPPOSITE- of what cloning offers- in order to make the human plasma field- actually immortal! SO - Stephen Hawking- who (like the obviously deprived primitive monkey like skull cavity of George Bush) sadly it appears - is lacking the biological equipment- to HAVE a glandular bliss experience. SO he advocates- the soullless approach of the Nephalim- Draco. OF course- those who choose a machine mechanical assisted form for metal life extension- for them the only form of life extension is a metal environment. Stephen Hawking limited understanding represents a 'ground-hog day' - we're gonna have to repeat this mistake - return to our soulless ancestors. Instead of maximizing the negentropic field effect of a genetic diverse biosphere to create the ensouling negentropic charge implosion of nature- with the yoga lifestyle of charge attraction- NO - these small minded - clueless to how DNA makes a soul types- would lead you down the literally DEAD end path - which took the Dracos ( our part ancestors) and the Greys- to their dead metal encased- soulless agony. Our past- and their soulless future- does not have to be our future! - talk about finding your job description IS the problem instead of the solution... By becoming his Father's team leading cloner- he discovered exactly how cloning was de-souling his bloodline- and offered the solution - the Caducceus. In the physics of wave mechanics- the Caducceus - IS the shape of a conjugate field. Naturally generated by DNA- in the right (blissful) biologic context- the conjugate wave (so called 'perfect storm' - rogue) - can propell our bioplasma aura- into the immortal. This becomes exactly the mechanism which makes Enki's profession THE CLONER- obsolete. 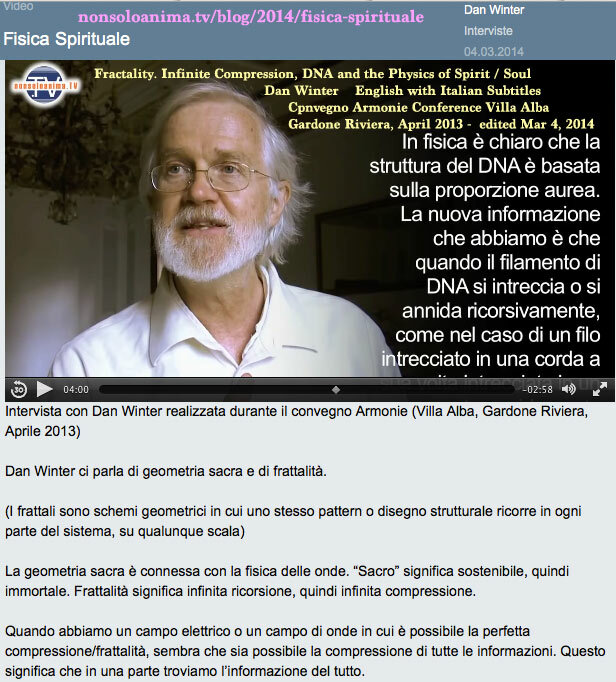 So - our story- we start with implosion in DNA..
About the DNA geometry: - First- a short review of what we have said in other articles about the PHYSICS of implosion / phase conjugation / negentropy in blood (soul by black hole)..
we clearly show the recursive braid algorhythmn of DNA is golden ratio phase conjugate (implosive). RADIUS OF TURN : Golden Ratio ^3 " ! with the Kluver Form Constants- the sequence of visions geometrical shown to be archtypal to the death visions sequence. is specifically contagious- and anyone sensitive nearby will often be sucked in. if you throw the ball coherently- it creates a plasma toroid which can sustain. It becomes the doorway thru death- to immortality- depending on coherence- whose climax form is phase conjugate. 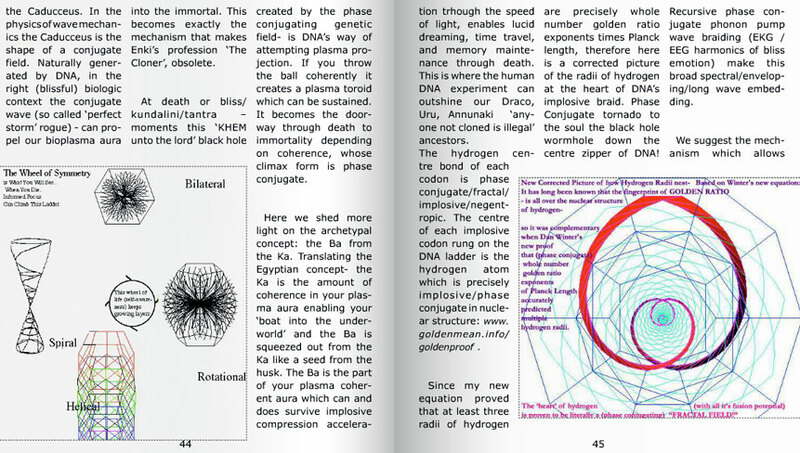 Translating the Egyptian concept- the KA - is the AMOUNT of coherence in your plasma aura- enabling your 'boat into the underworld' - and the BA is squeezed out from the KA- like a seed from the husk. The BA is the part of your plasma coherent aura - which CAN and DOES survive implosive compression acceleration THRU the speed of light - enables lucid dreaming, time travel, and memory mainenance thru death. This is where the human DNA experiment - CAN - outshine our Draco / URU / Annunaki - 'anyone not cloned is illegal' ancestors. 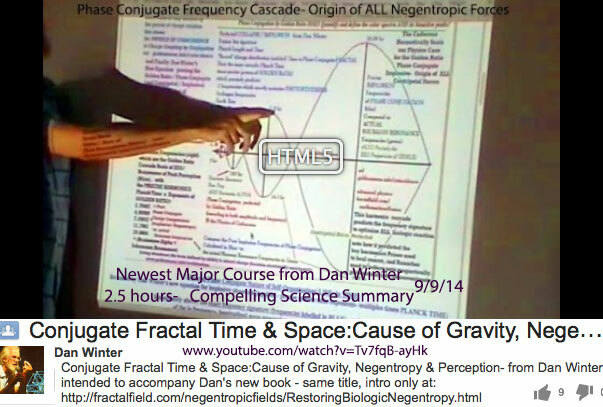 Phase Conjugate TORNADO- to the SOUL: the black hole wormhole down the center zipper of DNA! Recursive phase conjugate phonon pump wave braiding (EKG / EEG harmonics of bliss emtion)- make this broad spectral / enveloping / long wave embedding..
and now HeartsRing.com - HRV-heart /breath coherence- empathy training - iPhone /iPad. The major point of the MINDWAVE article and extensive film series - was..
the necessary LONGITUDINAL (compressional) WAVE- which accounts for psychokinesis - compression at a distance (fusion control) - the so called FLAME IN THE MIND! 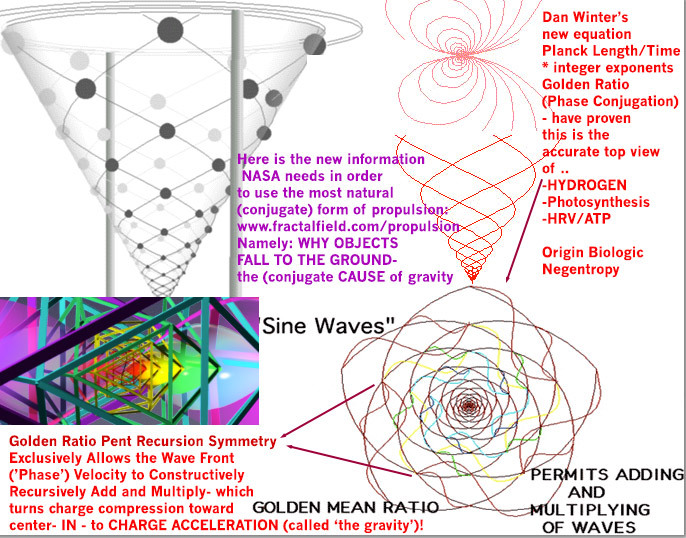 wave frequency recipe - essential to centripetal forces (making the FLAME IN THE MIND)- heart of psychokinesis. Note: this can be disorienting- use carefully. The psychological issue is that if your emotions cannot focus (you have not made your memories into a perfectly distributeable wave-) then the very nature of the perfect flame in your mind- first must 'burn' every emotion / wave not rendered SHAREABLE. (another way of saying- need to develop the focus of pure intention- gently first- before you try living in the FLAME - which like kundalini- will otherwise feel like 'hell'). 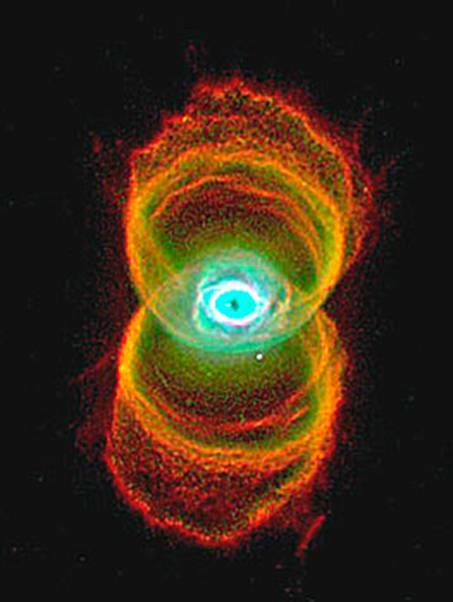 -thanks for your interest in what I believe is the most potent binaural beat audio software - for peak perception- yet. 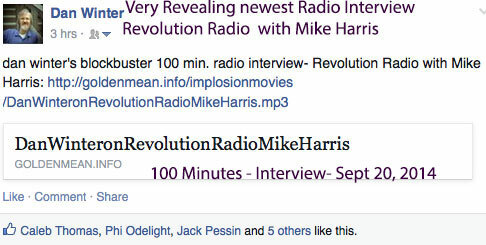 the description is at www.fractalfield.com/mindwave Particularly in the last film there.. 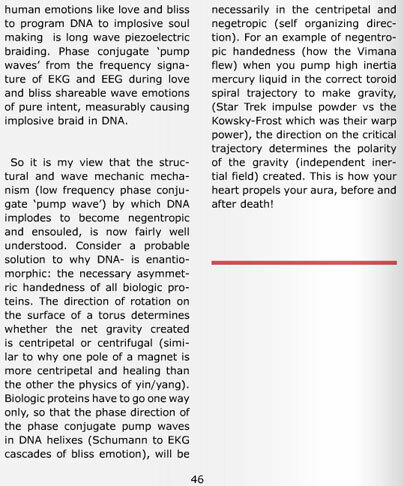 So it is my view - that the structural and wave mechanic mechanism (lo frequency phase conjugate 'pump wave') by which DNA implodes to become negentropic and ensouled - is now fairly well understood. Consider- a probable solution to WHY DNA- is ennantiomorphic: the necessary assymetric handedness of all biologic proteins. The DIRECTION of rotation on the surface of a torus- determines whether the net gravity created is centripetal or centrifugal (similar to why one pole of a magnet is more centripetal- and healing than the other- the physics of ying / yang). SO - biologic proteins HAVE to go one way only- SO that the phase direction of the phase conjugate pump waves in DNA helixes (schumann to EKG cascades- of bliss emotion) - WILL be necessarily in the centripetal AND negetropic (self organizing direction). Example of negentropic handedness- (HOW the Vimana flew) when you pump high inertia mercury liquid in the correct toroid spiral trajectory to make gravity (star trek impulse powder - vs the kowsky frost which was their warp power)- the DIRECTION on the critical trajectory determines the polarity of the gravity (independant inertial field) created. 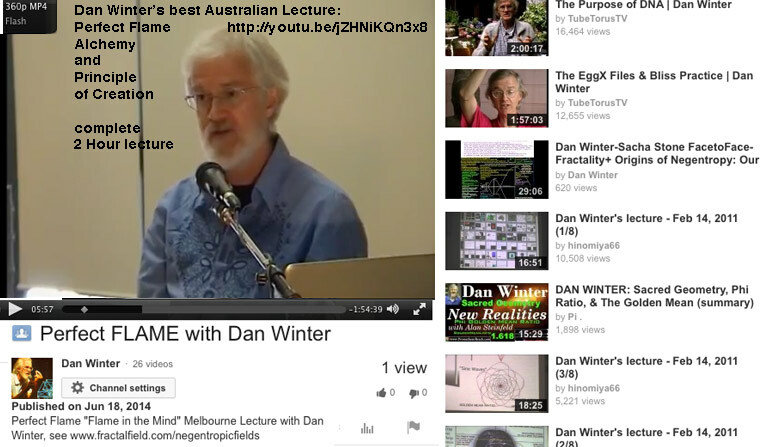 also- addend here- complete review of Priore Phase Conjugate Tech- below- added more from Tom Bearden- see bottom here..
Related new developments- we now have equations to show that the PHASE CONJUGATE MAGNETIC (term coined by Dan Winter) - frequencies Elizabeth Rauscher used in her FDA study on magnetic pain elimination- DID FIT Dan Winter's equation( planck time x golden ratio exponents) for phase conjugate magnetics. COMPRESSION RESTORED IS HEALING! 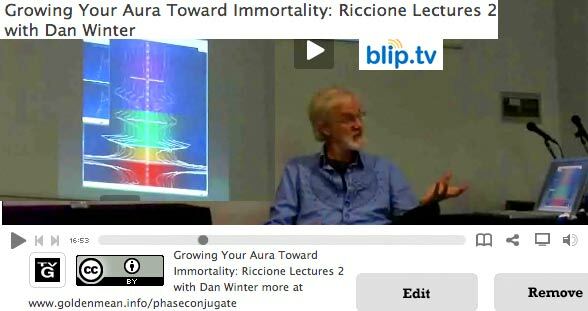 Over 1,000 people attended this lecture from Dan Winter, In Riccione Italy- on the Adriatic..
Click here for PART TWO of this film- English and Italian: Growing Your Aura- Toward Immortality:Science Review..! 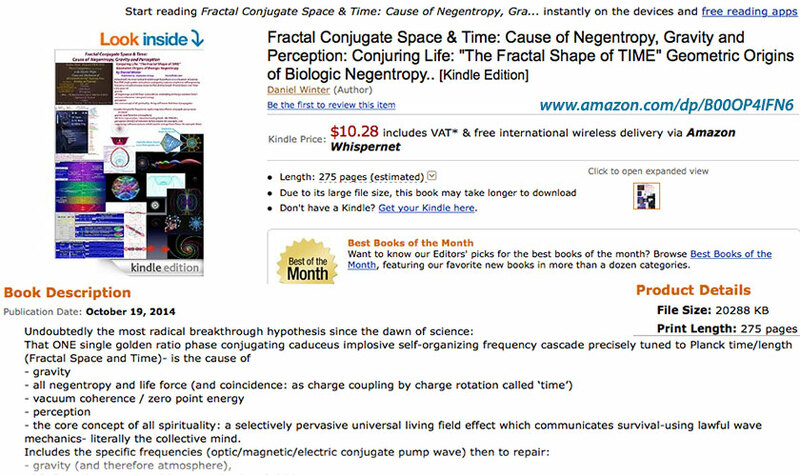 - which is an outstanding example of centripetal / conjugate fields- creating electrical HEALING SELF-ORGANIZATION. The principlen is that naturally phase conjugate noble gases are pumped with a conjugating frequency - which fits my new equation (planck time- exponents golden ratio!). 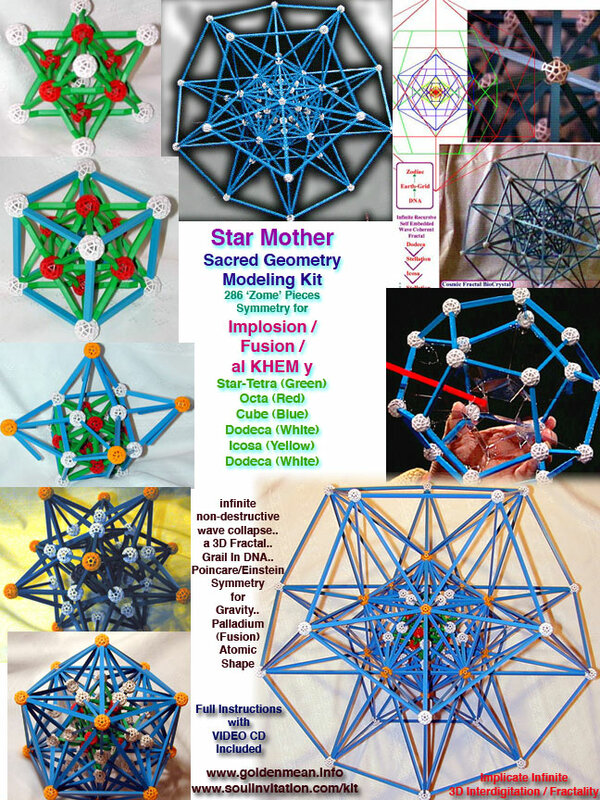 --This produces electromagnetic and optical conjugating/ centripetal fields- so essential to healing. Figure 1 shows the breakdown of energetics into its three branches. 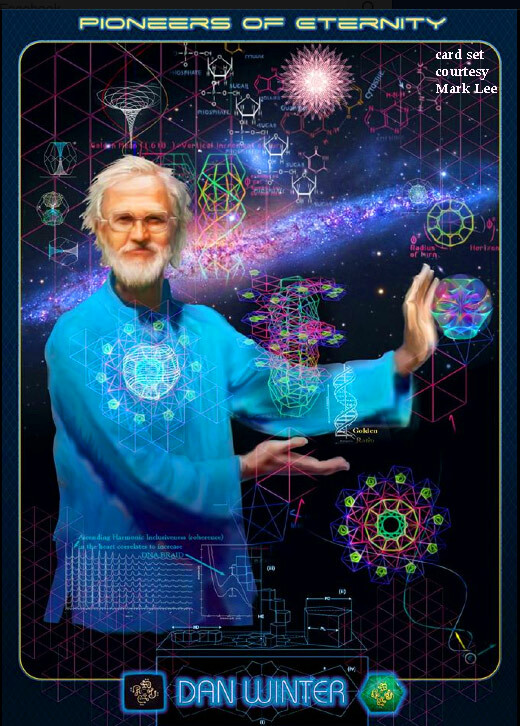 As an overall field, energetics is the application of Stoney-Whittaker-Ziolkowski (SWZ) internal structuring of the scalar potential, to constitute "hidden EM variables" in the sense of Bohm’s hidden variable theory. It is thus the application and usage of vacuum engines, and vacuum engineering. Also, Bohm’s quantum potential, including its SWZ structuring, is utilized and applied. Both local action and action-at-a-distance are incorporated in energetics. Partial support by the Association of Distinguished American Scientists (ADAS) is gratefully acknowledged. During the last two years, we have produced and published several papers with insights into the overunity energy field and the energy medicine field which indicate areas for further intensive and rapid development. 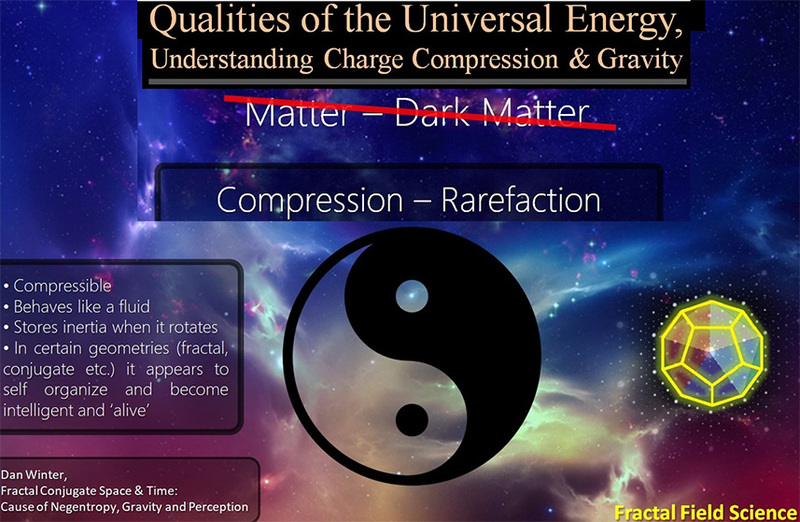 Parts 1 through 3 of this article summarized the progress made in understanding overunity energy systems, and pointed out the need for a new energy medicine. Part 4 summarizes the progress made to date in formulating the new energy medicine, and indicates the nature of future articles planned in the series. Some startling new overunity energy principles are also summarized. The Priore team cured terminal tumors, trypanosomias, and other dread diseases in laboratory animals in France, in the 1960s and 1970s, under rigorous scientific protocols by eminent scientists. The Priore project was funded by the French Government to the tune of several millions of dollars (equivalent). The Priore team’s results were impeccable, but no scientist has previously advanced an adequate explanation of the mechanism by which the puzzling usage of EM was able to perform such miracles. The key was in Priore’s manipulation of the internal EM hidden variables comprising the DC potential. Antoine Priore constructed a near-harmonic series of internal bidirectional "pump waves" (in the nonlinear phase conjugate optics sense) that pumped the cell and all its individual parts - including the genes and chromosomes - with pump waves in the internal structuring of the cell’s biopotentials. By standard nonlinear optics theory, this converted the cell and each of its parts to pumped phase conjugate mirrors. The physical pattern of the disease constitutes an electromagnetic "signal wave" in terms of 4-wave mixing theory. It also constitutes a vacuum engine in the inner "hidden variables" domain inside the biopotentials, by a corollary to Wheeler’s principle. Thus, by standard pumped phase conjugate mirror theory, exact antiengines for the specific disease were self-generated in the diseased cell and each of its parts. The result was that the cell was time-reversed back to an earlier state (dedifferentiated back to its normal healthy state prior to becoming diseased or disordered). It is accented that this mechanism is already the normal mechanism utilized by the body’s DC control system for its reparative or restorative system (as contrasted to the immune system). In the pumped case, the restorative mechanism is highly amplified by the nonlinear optical pumping in the interior EM channel utilized by the body’s own restorative system. In other words, Priore found how to amplify and augment the body’s own restorative system - something which had not previously been discovered, at least to such a degree. Independently from Priore, Becker had pioneered the use of DC potentials to accelerate healing of bone fractures [see Figure 26] and also to differentiate and redifferentiate cells. In Germany, Popp’s investigations into mitogenetic radiations from cells had revealed an underlying master cellular control system [Figure 27] which contained coherent photons. In the Soviet Union, Kaznacheyev had gone much, much farther. However, most of Kaznacheyev’s work appears to have been classified by the former Soviet government, and directly applied toward developing EM biological warfare systems. Two U.S. ambassadors were killed, dying with leukemia-like diseases. A third ambassador sickened, was transferred, and later died of a leukemia-like disease. Hosts of health changes were generated in personnel, but only in those areas free from EM force fields (i.e., with zero gradients of the scalar potentials). This provided a 100% correlation to the thesis that the persistent (i.e., gradient-free potentials) were the culprit. In turn, that directly shows application of energetics, vacuum engine templates, etc. - which sometimes the Soviets refer to as the information content of the field. We have adequately documented this weapons application of vacuum engines elsewhere. We will now briefly point out the work of Becker and of Popp. The "inner EM" or "hidden EM variables" explanation we have advanced for Priore’s work also dramatically expands upon Becker’s demonstrated DC potential restorative control system in biological organisms. In profound work, Becker proved conclusively that DC potentials with extremely weak currents (picoamperes) could indeed dedifferentiate (i.e., time-reverse) cells, genetics and all, back to a previous state. He also proved that it can iteratively redifferentiate cells, i.e., change the cell along the forward-time track, to a new cellular development (differentiation) type, thereby providing the local type of cell needed by the specific type of tissue and injury. Again see above Figure 26. In his pioneering of electrical DC potential (and picoampere DC current) treatment of otherwise intractable bone fractures, Becker showed that rather astounding healing occurred. He then showed that the red blood cell first dedifferentiated (time-reversed) by shucking its hemoglobin and growing a nucleus. Then that "new" cell redifferentiated (time-forwarded) into the type of cell that makes cartilage. Then that new type of cell redifferentiated into the type of cell that makes bone. Whereupon the latter cells were deposited in the fracture as new bone growth. Becker was nominated for a Nobel prize for this epochal work. For his noble efforts, he was hounded, castigated, his funding dramatically curtailed, etc. 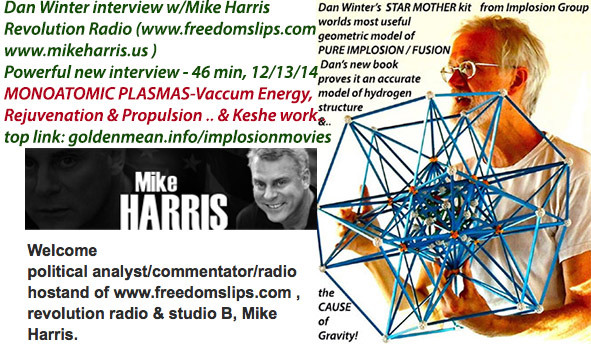 The proposed vacuum engine explanation we have advanced of the Priore effect also dramatically extends Popp’s discovery of the coherent virtual photon involvement in the master cellular control system of the living body. Creating and using a vacuum engine (deliberate structuring of the virtual photon flux of the vacuum) is indeed the mechanism achieved by the Priore effect. Weak vacuum engines are also achieved in the body, as part of Becker’s DC potential control system for the body’s restorative system, and Popp’s master cellular control system, once the Stoney, Whittaker, Ziolkowski (SWZ) internal biwave structuring of the scalar potential is incorporated. The implications to AIDS, e.g., of directly "time-reversing" an HIV-infected cell and all its genetics, back to a previous normal state, is obvious. The Priore cellular reversal therapeutic technique, if redeveloped and applied, could result in the total, quick, cheap cure of AIDS, including riddance of all HIV-infected cells, in possibly two or three treatments with very weak, non-ionizing radiation in special manner. We accent non-ionizing radiation by strong, rippling magnetic fields; no nuclear radiation or overt high frequency EM radiation need be involved. The moment an individual tested HIV positive, the Priore type treatment could be performed. Every cell in the body would be affected. Normal cells would just get a little younger. HIV-infected cells would just be reversed back into normal cells, genetics and all. Thus a total cure for the AIDS patient could be achieved without waiting for the slow destruction of the patient’s immune system and restorative system - which are followed by debilitation, intense suffering, and lingering death. The problem in AIDS infections is that, regardless of how one tries to "kill" the HIV-infected cells, not all of them are killed and a few escape. Obviously, the few that escape were more resistant to the lethal agent than were those who were killed. 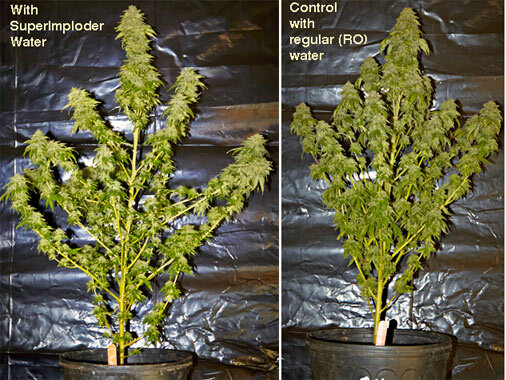 As this is repeated, the treatment is repeatedly selecting the most resistant strains of the virus that are present. Also, the unstable + virus itself continues to change and adapt. Eventually the disease "adapts" to its host’s weakened immune system weaponry and almost any other weaponry brought to bear to kill it. Every HIV-infected cell is still an HIV-virus factory. As the viruses win the battle against the immune system and medical agents, these factories have more and more survivors, and the HIV infection grows apace. With resistance achieved by the new strains of HIV viruses poured out into the bloodstream, the disease spreads until the standard symptoms and debilitation appear. Meanwhile, the immune system is steadily degraded, as is the body’s recovery or restorative system. Other infectious agents which could normally be countered by a healthy immune system, now begins to pose lethal threats. In the advanced AIDS patient, death usually results from opportunistic infections that develop and thrive in the seriously weakened body with its depleted immune system and depleted restorative system, killing the patient. At the present time, all conventional treatments can do naught but prolong the process. The eventual result is almost certain death. With the Priore approach, at any stage in the AIDS disease progression, the HIV-factories (HIV-infected cells) would be simply time-reversed back into normal cells, genetics and all. This would totally remove all HIV virus and all HIV-factories (infected cells). Thus the present great problem of AIDS - the inability of the body and present medical therapies to rid the body of all HIV-factories in the body early on - would be solved. As proven by the Priore group, the energetics would also restore the immune system to vigorous functioning, and it would revitalize the restorative system as well. Instead of prolonging the life of the AIDS patient a bit, it would dramatically reverse the disease and cure the patient. In other words, it would represent a total interruption and elimination of the entire AIDS-producing process in the infected patient. Nothing else presently proposed has such an awesome capability for AIDS disease reversal. It’s also a completely different medical approach: Instead of killing the struggling cells that are infected - which after all is killing part of the immune system as well! - simply help the infected cells immediately change back into normal cells again, by highly amplifying the very mechanism by means of which the body’s cellular restorative system works anyway. Becker et al. already rigorously proved in vivo that cells - genetics and all - can be time-reversed and time-forwarded by application of very weak EM. Priore rigorously proved that such can be applied to the whole body, to achieve remarkable and unparalleled remission of dread diseases. AIDS was not known at the time of Priore’s major work, and therefore was not treated. 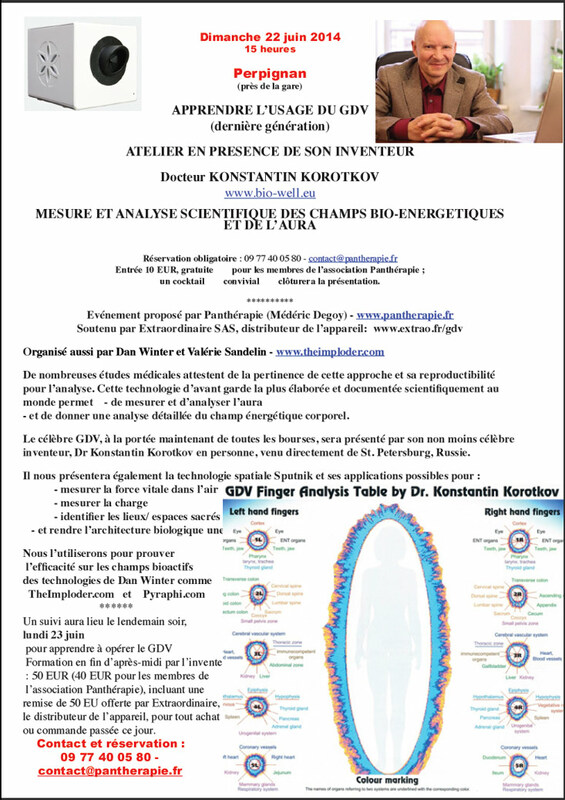 However, the technical basis for the entire above discussion on the ability of energetics to cure AIDS, is already rigorously proven in the laboratory, and the results are published in leading French scientific journals. The only barrier to the greatest medical breakthrough in history is the dogmatic minds of our present scientists and scientific administrators. It is our firm opinion that, if the conventional medical science and energy communities were less dogmatic and biased, these are the types of potential solutions they would be working on with alacrity, and developing at top speed. 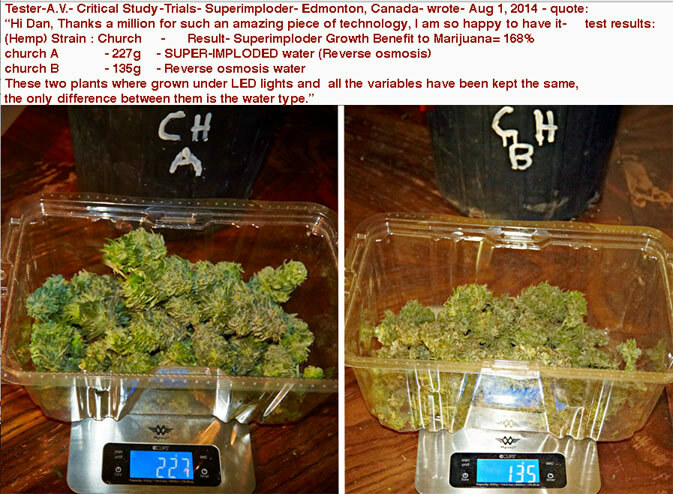 The results in the preceding discussion have been rigorously proven by eminent scientists, in laboratory experiments. The technical basis we have extended from the work of Becker, Popp, Kaznacheyev, Stoney, Whittaker, and Ziolkowski is solidly founded. That the results of these pioneering scientists are ignored and even suppressed is a glaring commentary on the extreme bias of our present medical science community. It is also a sad commentary on the condition of our physics and electrodynamics communities, which adamantly refuse to overhaul electrodynamics and quantum mechanics, to incorporate Bohm-type hidden variable theory, particularly of the engineerable EM kind shown by Stoney and Whittaker, and also by Ziolkowski. Present electromagnetics, medical therapy, and electrical power technology are in woeful shape. Without further discussion, Figure 27 above, shows just how bad the classical electromagnetics problem is. The very foundations are seriously flawed. The problem seems to this researcher to lie primarily with the "science controllers" - they who control and dispense the funding extracted from the taxpayers. Many famous scientists have previously commented on the absolute requirement to continually review and revise the foundations of our scientific models and theories, and on just how hard it is to displace the prevailing dogma in physics. "...the scientist makes use of a whole arsenal of concepts which he imbibed practically with his mother’s milk; and seldom if ever is he aware of the eternally problematic character of his concepts. He uses this conceptual material, or, speaking more exactly, these conceptual tools of thought, as something obviously, immutably given; something having an objective value of truth which is hardly even, and in any case not seriously, to be doubted. ...in the interests of science it is necessary over and over again to engage in the critique of these fundamental concepts, in order that we may not unconsciously be ruled by them." Many scientists and graduate students would be delighted to work on these potential enhanced electromagnetism solutions, if the "money controllers" would allow funding for such efforts. The dogma and biasing of the scientific community is achieved primarily by these "money and program controllers," many of whom (just as in other human fields) are interested primarily in personal power, prestige, turf, and control. The working scientist must desperately struggle with intensive grant applications, along only acceptable lines, if he is to have funding and remain employed at all. 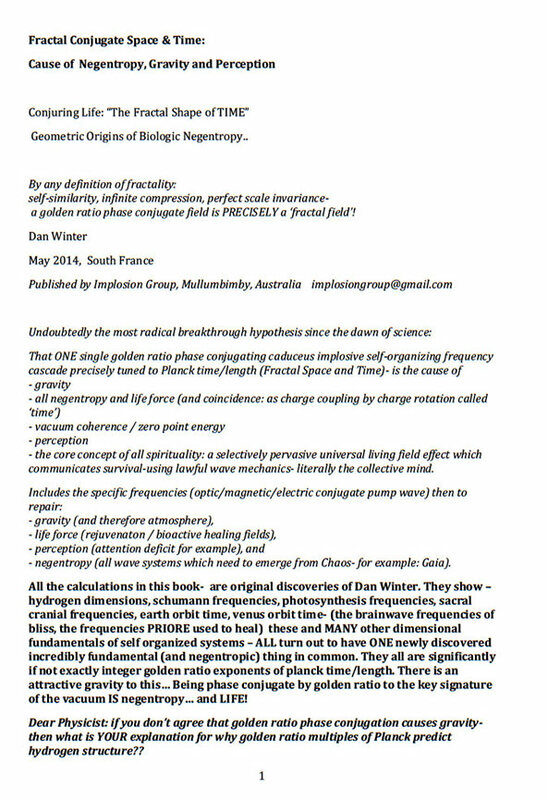 So conventional scientists are largely not permitted to work on problems such as AIDS and cancer and the energy crunch, along enhanced Stoney/Whittaker/Ziolkowski hidden variable electromagnetic lines. Meanwhile millions of persons die needlessly every year, the meter stays on the gas pump for the automobiles, and the electric power meter stays on the house, factory, and city for electrical utilities. And the wholesale pollution of the planet and our own bodies continues apace. In Big Science administration it’s the old "Golden Rule"
"He who has the gold, rules!" In light of the iron dogma in science, all a single researcher can do - with no funding, laboratory, staff, or supplies, and with open hostility from the orthodox establishment - is just doggedly persevere in trying to solve the foundations problems in energy science, and communicate the solutions as widely as possible. In the future we shall endeavor to continue to do just that, along the lines indicated below. A future article will show methods and processes which will and do increase the amount of energy collection from the raging Poynting energy flow, and will and do use (dissipate) the excess collected in electrical systems to perform useful work. Working examples will be given; including the Letokhov-Lawandy effect (and the highly significant Lawandy patents and experiments), the Patterson effect (and patents), and the fiber fuse effect. We will accent that the same energy flow can be retroreflected and additional energy recollected from it. Energy itself is always a flow, as opposed to energy collection. Energy used once can be used yet again; the entire process can be iterated incessantly. A single joule of energy can do a million joules of work! We just have to collect that same joule of energy flow one million times. Already nature does it this way, scattering and reusing the same energy, over and over. It is high time that we learned and utilized nature’s own "iterative energy reuse" system. Energy is never used up, but simply reused again and again. So we will accent iterated, multipass, multicollection from iteratively retroreflected Poynting energy flows. 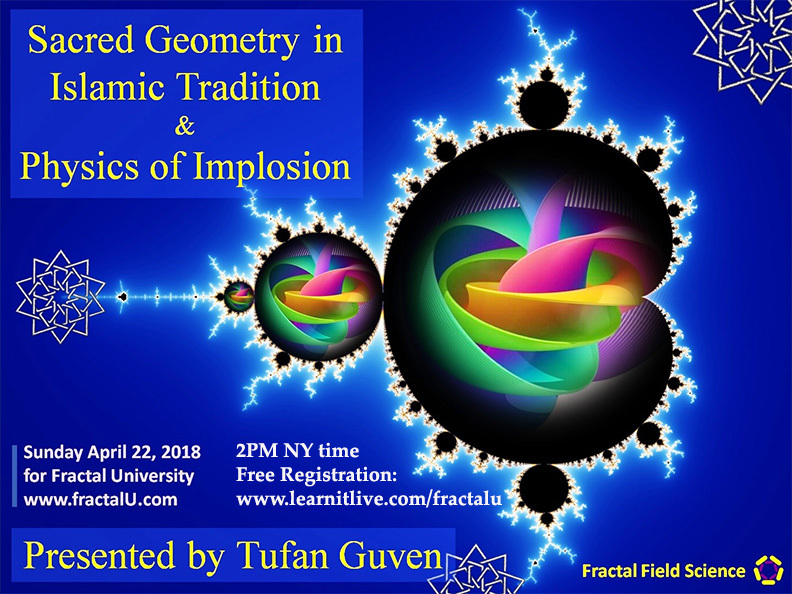 We will also discuss the use of the quantum potential in order to directly amplify energy collection by automatically iterating a local energy template at multiple distant collection locations. The first two effects (Letokhov-Lawandy effect and Patterson effect) are both cases of what is referred to as the Anti-Stokes Effect. In the Anti-Stokes effect, the medium outputs more energy than the stimulation contains that one introduces. Classically, the remainder of the output energy is assumed to come from molecular transactions, etc. These extensions to the anti-Stokes effect caused the present author to name the TiO2-type case the Letokhov-Lawandy effect, and to name the charged beads-type case the Patterson effect. In each case, there has been highly significant augmentation of the basic anti-Stokes effect to warrant naming it as a new effect of its own. In addition, either the Patterson case or the Lawandy case can also involve a quantum potential, which has not previously been even conceived of in conjunction with the anti-Stokes effect. See Figure 30 and Figure 31. The Letokhov-Lawandy effect and the Patterson effect recover their excess emission energy directly from the vacuum energy exchange. They utilize iteration of both retroreflection and collection. As the multipass, multicollection process increases the local (collected) energy density, in turn that increases the magnitude (energy density) of the local scalar potential, increasing the E-field accordingly. In turn, that increases the Poynting energy flow, which further increases the amount of energy collected in each pass of the S-flow over a collector particle (Lawandy) or bead (Patterson). This positive feedback continues until stabilized at some level determined by the increasing rate of escape by multiple scattering actions from the perimeter of the collectors. The Patterson device and the Lawandy device also can partially utilize a quantum potential, which power engineers presently know zilch about, and which most physicists know very little about. The degree of susceptibility to initiating a quantum potential (QP) is a function of the phase conjugate reflection activity produced by each collector (particle or bead). Formation of a quantum potential adds a totally new dimension to the energy collection: Once the QP forms, each collector (bead or particle) has some fraction of participation in the overall quantum potential. In this case, to the external observer direct energy multiplication occurs, which violates any "energy propagation" model of energy transfer in a singly-connected space. Nonetheless, overall conservation of energy is not violated when the vacuum interaction is included. One is simply replicating the same ordering (template) of the local vacuum, at multiple locations simultaneously. So the excess energy arises from the local vacuum at each station (as seen by the external observer). In the particular case, imperfections in the quantum potential process limit the amount of direct energy amplification, by limiting the degree to which a multiply connected space is achieved. Also, as the multiple connections in space improve and energy amplification rises, the distortion and instability of the multiple space connections i.e., the degradation of what Wheeler called wormholes) increase exponentially. This provides a maximum, finite stability level so that the QP stabilizes at a finite value, as does the energy amplification factor. Otherwise, there would be no limit whatsoever to the amount of energy that a quantum potential - e.g., as in Lawandy’s new form of lasing - would rapidly produce. In fact, if perfectly formed in a perfect, multiply connected space, a QP would immediately produce a self-inflated "false vacuum," and a great new "Big Bang", resulting in the creation of an entirely new universe, separate from this one. Whether or not it would utterly destroy this particular universe is a matter of conjecture. Fortunately, we need not worry about creating a new "Big Bang"; the normal processes allow the formation of only a fractional QP, with rapid degradation and total clamping of the maximum energy level, for a particular QP-generating process. We published the mechanism for making a quantum potential some time ago, obscurely in 1989 and later in a book, Gravitobiology, in 1991. At any rate, the exposè of the use of multipass collection, negative absorption by the medium, iterative retroreflection of scattered energy, and the quantum potential as a method of enhancing energy collection in overunity devices is planned for future articles. See Figure 32 below. The fiber fuse problem is presently "unsolved" by conventional science (although Russell and his colleagues are very close). However, it always produces more energy out (by far!) than what one puts in to initiate it. The extraordinary thing is that, even after the fiber fuse runs (at about a meter per second) the length of a fiber optics cable and "destroys" it (even for many, many kilometers), the physical damage - holes blown in the core about every centimeter or so - can often be reversed by simply reversing the laser light direction down the cable and re-initiating the fiber fuse from the other end. The series of holes about every centimeter of so, down the entire cable, will then often be refilled again with material, sufficiently to restore a functional cable! The Letokhov-Lawandy effect [Figure 30 far above] and the fiber fuse [Figure 32 above] are readily demonstrable by any university lab (sophomore level). Patterson is proceeding toward commercialization of his independently validated overunity approach. Presently Lawandy seems focused on lasing; it remains to be seen whether or not he will recognize the electrical power system implications of the effect. I suspect that he will or has already, and that we will see Lawandy overunity systems in our power future. In the future we will also acquaint the reader with a host of other overunity or potential overunity effects, devices, and principles. In one sense the summarized work over the last few years has been enormously productive, at least in increased insight into electrical power and medical therapy possibilities. As Figure 33 above clearly shows, asymmetrical regauging - which the electrodynamicists themselves admit is free for the taking - will generate excess force, excess energy, and positive work. The funds spent by the U.S. Government in a single week on cancer, AIDS, and energy would re-establish the entire Priore approach, as well as develop a plethora of practical overunity systems, were those funds focused on the extended hidden variable electromagnetics approach that is represented by energetics. Figure 34 above graphically characterizes the real problem: As a nation, we still have our collective scientific and medical and governmental heads in the sand, like the proverbial ostrich. The ostrichlike attitude, "Pretend we don’t see it, and maybe it will go away!" can no longer be justified. Nonetheless we continue to make slow progress. As new developments occur, they will be shared openly with the reader here in Explore!, over the InterNet as in The Virtual Times (http://www.hsv.com), in books, in journal articles, and in other publications. This concludes this four part series. T.E. Bearden, "Maxwell's equations, regauging, and overunity systems," Explore More!, No. 17, Jul.-Aug. 1996, p. 13-21; ____ "The Master Principle of EM Overunity and the Japanese Overunity Engines," Infinite Energy, 1(5&6), Nov. 1995-Feb. 1996, p. 38-55;____"Regauging and Multivalued Magnetic Scalar Potential: Master Overunity Mechanisms." Explore!, 7(1), 1996, p. 51-58; ____ "The Master Principle of Overunity and the Japanese Overunity Engines: A New Pearl Harbor? ", The Virtual Times, Internet Node WWW.HSV.COM, January 1996;____"The Final Secret of Free Energy," Association of Distinguished American Scientists, POB 1472, Huntsville, Alabama 35807, Proceedings of the International Forum on New Science, Fort Collins Colorado, September 1992, also distributed over the Internet; ____ "Free Energy: The Final Secret," Explore!, 4 (3/4), 1993, p. 112-126; ____ "Overunity Electrical Devices and Free Energy," Explore!, 5(1), 1994, p. 74-82; ____ "Overunity Electrical Power," address presented to the 2nd International New Energy Symposium, Denver, Colorado, May 15, 1994; ____ "Overunity Electrical Power," address presented to the 2nd International New Energy Symposium, Denver, Colorado, May 15, 1994; "Use of Asymmetrical Regauging and Multivalued Potentials to Achieve Overunity Electromagnetic Engines," Journal of New Energy, 1(2), Summer 1996, p. 60-78. T.E. Bearden, "Vacuum Engines and Priore's Methodology: The True Science of Energy-Medicine, Parts I and II," Explore!, 6(1), 1995, p. 66-76; 6(2), 1995, p. 50-62; ____ "Mechanism for Long-Term Cumulative Biological Effects of EM Radiation," presented to the 70th Annual Meeting of the Alabama Academy of Science, University of Alabama at Huntsville, March 25, 1993; ____ Cancer and the Unresolved Health Issues in the Biological Effects of EM Fields and Radiation, Tesla Book Company, POB 121873, Chula Vista, CA 91912, 1993. Bearden, Explore!, 6(1), 1995, p. 66-76; 6(2), 1995, p. 50-62. Bearden, Explore!, ibid., Part II. As one example, a given Priore radiation of a rat with a particular type of grafted terminal tumor would cure that rat. Another rat with the same type of graft could then be cured, merely by injecting the second rat with a single drop of blood from the first rat. Needless to say, orthodox cancer therapists were horrified -- and vehemently opposed this work because they themselves could produce nothing even remotely resembling the Priore effectiveness, nor could they understand how Priore did it. Strangely, a French Government report by physicists who closely examined the work in detail, and reported very positive findings, remains classified to this day by the French Government. One may speculate that the report may have recognized the internal structuring of the scalar potential (i.e., vacuum engines) created by Priore. If so, such recognition would only be accomplished and remain classified if the French government were already involved in classified work in that technical area, directed toward weapons. Two good references on the functioning of pumped phase conjugate mirrors are: (1) Amnon Yariv, Optical Electronics, 3rd Edn., Holt, Rinehart and Winston, New York, 1985, Chapter 16: "Phase Conjugate Optics -- Theory and Applications,"; and (2) David M. Pepper, "Nonlinear Optical Phase Conjugation," Optical Engineering, 21(2), March/April 1982, p. 156-183. Wheeler's principle deals with the mutual interaction between the violent flux of vacuum/spacetime and matter, and is stated in W. Misner, K.S. Thorne, and J.A. Wheeler, Gravitation, W.H. 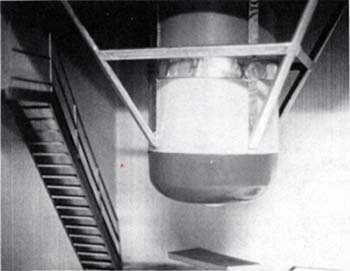 Freeman and Co., San Francisco, 1973, p. 5 as: "Space acts on matter, telling it how to move. In turn, matter reacts back on space, telling it how to curve." Since matter is just locally collected (trapped) energy (by Einstein's E=mc2), we may retranslate Wheeler's principle as: "Space acts on trapped energy, telling it how to move. In turn, trapped energy reacts back on space, telling it how to curve." The present author has extended Wheeler's principle and added it to electrodynamics to form a powerful corollary. This corollary constitutes the Principle of Vacuum Engines (or the Principle of Vacuum Engineering), as follows: "Nested spacetime curvatures tell electromagnetic energy how to internally structure, be trapped, and change; and internal electromagnetic energy structuring, trapping, and dynamics tell local spacetime how to internally nest multiple curvatures to form local vacuum engines. By this principle, it can be seen that Priore -- in creating and manipulating nested EM energy structuring, was forming local vacuum engines. His method utilized the "template" vacuum engine of the disease's deviation from normal, as the "signal input" to the cell-and-its-parts-as PCMs. Priore's nested, structured biwaves impinging upon these PCMs constituted pump waves, in the nonlinear optical sense. Thus an amplified antiengine was formed in the cell and in every part of it, precisely against the specific disease's vacuum engine template. The result was the rapid time-reversal of the PCMs (the cell and all its parts), dedifferentiating the affected cell and all its parts back to the previous normal condition. Priore actually finished his doctoral course work and thesis, and submitted the thesis. The Cancer Cartel brought such pressure on the university that its review committee did not dare accept the thesis. The actual thesis is presently in the personal files of the present author. See T.E. Bearden, AIDS: Biological Warfare, Tesla Book Company, 1988, passim; _____ Gravitobiology, ibid., 1991, passim; _____ "Vacuum Engines and Priore's Methodology: The True Science of Energy-Medicine. Parts I and II." Explore!, 6(1), 1995, p. 66-76; 6(2), 1995, p. 50-62. Based on Stoney's and Whittaker's work. Oddly, Whittaker's 1904 paper showing that all classical EM fields and waves could be replaced by two scalar potentials was partially utilized in physics, and initiated what is now called superpotential theory. Reference to superpotentials is in Springer's Encyclopedia of Physics, passim. Two authors (Melba Phillips in Vol. 4 and H. Bremmer in Vol. 16) describe the Whittaker Potentials as a "special case" of scalar superpotentials, which are related to the "Debye Potentials" and the "Bromwich Potentials." Both articles refer to papers by Nisbet, McCrea, Casimir, etc. Dirac also worked in superpotential theory. Strangely, even though Whittaker's 1904 paper is credited today with initiating superpotential theory, Whittaker's 1903 paper showing the hidden EM variable (wave) decomposition of the scalar potential has been largely ignored, even though the two Whittaker papers taken together lay the basis for all of Soviet energetics and an engineerable hidden variable theory. However, exceptions to the general disregard for the Stoney/Whittaker biwave decomposition of scalar potentials are provided in papers published by a few scientists such as Ziolkowski, Cornille, and Barrett. Robert O. Becker; Charles H. Bachman, and Howard Friedman, "The direct current system: A link between the environment and the organism," New York State Journal of Medicine, Vol. 62, April 15, 1962, p. 1169-1176; R.O. Becker, "The direct current field: A primitive control and communication system related to growth processes," Proceedings of the. XVI International. Congress of Zoology, Washington, D.C., Vol. 3, 1963, p. 179-183. 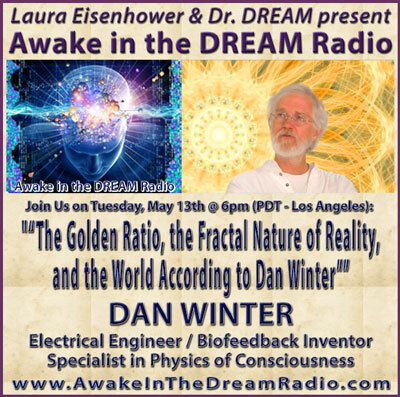 Becker has stated in effect that the restorative or reparative system in the living animal is electromagnetic in nature, but of a peculiar kind involving dc currents (and therefore dc potentials). He notes that it functions, however, as an analog command and control system. He points out that it corresponds to the entire organism, and calls for further study and experimentation. The present author has extended Becker's epochal work to incorporate the hidden variable biwave structuring of the scalar potential, and the fact that not just signal theory but vacuum engines are involved. The concepts of classical EM are insufficient to describe this system properly, because it uses the internal Stoney, Whittaker, Ziolkowski structuring. Instead of an EM "signal," the control systems sends a vacuum engine to the cell. That vacuum engine is a structuring of the local vacuum flux. The vacuum engine is a Maxwellian demon and it performs work upon the cell and all its parts, including its genetics. Hence its ability to dedifferentiate and redifferentiate cells, including their entire genetics. An excellent discussion of this work, for the layperson, is given in Robert Becker and Gary Selden, The Body Electric, William Morrow and Company, New York, 1985. This bone-healing application of the amplification and augmentation of the body's restorative system is approved by the Federal Drug Administration, and utilized in treatment of otherwise intractable bone fractures. F.-A. Popp et al., "Physical aspects of biophotons," Experientia, Vol. 44, 1988, p. 576-585; _____ "Photon Storage in Biological Systems," in Fritz Albert Popp et al, eds., Electromagnetic Bio-Information: Proceedings of the Symposium, Marburg, Federal Republic of Germany, Sep. 5, 1977; Urban & Schwarzenberg, Baltimore, 1979, p. 123-149. Popp approaches the results of the "internal EM hidden variables" quantum mechanically, using the standard Bohr QM instead of Bohm's more fitting hidden variable theory of QM. Actually Becker's DC restorative control system and Popp's cellular control system are one-and-the-same in the living body. Becker approached the problem in terms of a classical electromagnetics model; Popp approached it in terms of quantum mechanics and a quantum electrodynamics model. Stoney and Whittaker advanced the sum set of the hidden bidirectional EM waves that comprise the scalar potential. Ziolkowski added the product set. Here's a master identity statement for the deep thinker, one that has previously escaped scientific notice: Scalar potential not spacetime geometry virtual state presence of energy collection. Also, internal structuring of one of those terms is identical to internal structuring of each of the others. Internal dynamics of one is identical to internal dynamics of each of the others. So if you can internally engineer and structure one of them, then you can (given sufficient technological development) internally engineer and structure any of them. Further, all observables are composed of ensembles (structures) of the internal elements of one/all of these. Hence one can engineer the entire observable state -- so-called macroreality itself, including the vaunted "laws of physics" -- if one can engineer any one of the elements of the master identity. The importance of the Stoney, Whittaker, and Ziolkowski work is that, taken together, they show precisely how to engineer that entire master identity electromagnetically. Mind and mind/matter interactions can also be included in this engineering model, but that is another story for another treatise. 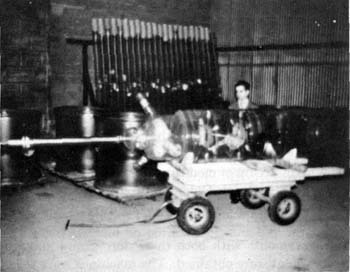 Priore's last machine was a very large, 4-story affair capable of providing whole-body rippling magnetic field exposure to the entire human body. That device was designed to heal terminal illnesses such as cancer in two 5-minute exposures, to a very strong and rippling magnetic field containing the inserted Stoney/Whittaker/Ziolkowski biwave structure, where the exposures are one week apart. There appears to be no valid reason why such procedure could not be utilized for rather total rejuvenation of cells in the body, thereby reversing the effects of aging, or most of them. The Priore therapy was rigorously demonstrated to clear clogged arteries, restore suppressed immune systems, cure terminal tumors, cure terrible and advanced trypanosomias, etc. Indeed, in case of HIV infection, from the very outset of the infection the body's immune system makes a Herculean effort, literally killing almost all the hostile viruses and infected white cells. This effort continues without letup, so the body operates "normally" to all external appearances, for an extended period. However, gradually the repeatedly selected, more resistant viruses and infected cells survive, more and more. Slowly the body loses its titanic struggle, and the immune system -- which is finite and is also being progressively degraded by the virus, gradually loses the battle. For a vivid description see E. Pennisi and K.A. Fackelmann, "HIV toll: Over a billion white cells a day," Science News, 147(2), Jan. 14, 1995, p. 21. See the Jan. 12, 1995 Nature, for the report by the two study teams who uncovered the fact that the virus is not dormant initially, and an editorial by Simon Wain-Hobson of the Pasteur Institute in Paris. The studies show that HIV actually replicates furiously, inducing a titanic struggle between the virus and the immune system, from the very outset -- a struggle that the slowly degrading immune system eventually loses. There are a very small number of patients, however, whose strain of AIDS seems to lie dormant. They have the virus, but somehow the terminal debilitation phase does not occur. Present quantum mechanics is already known to be wrong because it does not possess just such hidden order; for an excellent lay discussion of the missing chaos problem, see Robert Pool, "Quantum Chaos: Enigma Wrapped in a Mystery," Science, 243(4893), Feb. 17, 1989, p. 893-895. For a more technical discussion, see P.V. Elyutin, "The quantum chaos problem," Sov. Phys. Usp., 31(7), July 1988, p. 597-622. Presently QM is based on random variable theory, taken directly from Gibbs' original thermodynamics statistics. So it excludes the organized macroscopic world we live in, because its "random variables" when integrated to the macro level yield only further randomness. In other words, random ordering of variables have a "signal to noise" ratio of zero. 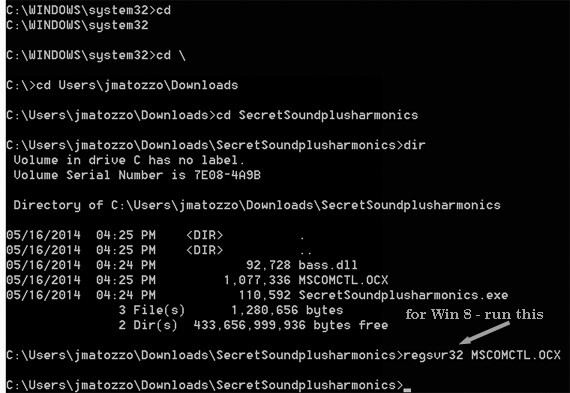 Hidden ordering of variables, on the other hand, will have a signal to noise ratio greater than zero (STN>0.0). If STN>0.0, coherent integration will steadily increase the signal faster than the increase of the noise. Coherent integration will eventually yield the familiar macro universe that we observe. If one believes in a correspondence principle as covering the boundary layer between observable and virtual, or between quantal and subquantal, then one can jolly well apply the principle in either direction. This means that the macrolevel can be used as a set of boundary conditions or a forcing function upon the subquantal level. In other words, one can insist on partial subquantal ordering, a priori, because of the observed macro-ordering. It is inexplicable that most quantum physicists, in still vigorously objecting to hidden variables, are in fact defending the prediction that they themselves do not exist. Classical electrodynamics is so riddled with errors and omissions that it must be completely redone. As stated succinctly by Bunge, "...it is not usually acknowledged that electrodynamics, both classical and quantal, are in a sad state." (Mario Bunge, Foundations of Physics, Springer-Verlag, New York, 1967, p. 176. 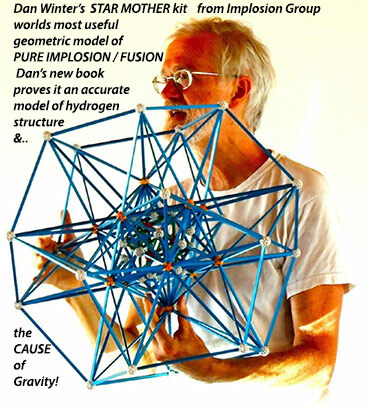 Bunge adds: p. 182: "...the best modern physicist is the one who acknowledges that neither classical nor quantum physics are cut and dried, both being full of holes and in need of a vigorous overhauling not only to better cover their own domains but also to join smoothly so as to produce a coherent picture of the various levels of physical reality." Nabil M. Lawandy, "Optical Gain Medium Having Doped Nanocrystals of Semiconductors and Also Optical Scatterers," U.S. Patent No. 5,434,878, July 18, 1995; ____ "Second Harmonic Generation and Self Frequency Doubling Laser Materials Comprised of Bulk Germanosilicate and Aluminosilicate Glasses," U.S. Patent No. 5,157,674, Oct. 20, 1992; ____ "Optical Gain Medium Having Doped Nanocrystals of Semiconductors and Also Optical Scatterers," U.S. Patent No. 5,233,621, Aug. 3, 1993; ____ "Optically Encoded Phase Matched Second harmonic Generation Device and Self Frequency Doubling Laser Material Using Semiconductor Microcrystallite Doped Glasses," U.S. Patent No. 5,253,258, Oct. 12, 1993; ____ "Optical Sources Having a Strongly Scattering Gain Medium Providing Laser-like Action," U.S. Patent application No. 08/210,710, filed Mar. 19, 1994. See also Nabil M. Lawandy, R.M. Balachandran, A.S.L. Gomes and E. Sauvain, "Laser action in strongly scattering media," Nature, Letters, 368(6470), Mar. 31, 1994, p. 436-438. James Patterson, "System for Electrolysis of Liquid Electrolyte," U.S. Patent No. 5,372,688, Dec. 13, 1994; ____ "Method for Electrolysis of Water to Form Metal Hydride." U.S. Patent No. 5,318,675, June 7, 1994; ____ "Metal Plated Microsphere Catalyst," U.S. Patent No. 5,036,031, July 30, 1991; ____ "Improved Process for Producing Uniformly Plated Microspheres," U.S. Patent No. 4,943,355, July 24, 1990; ____ ; James Patterson, U.S. Patent No. 3,577,324, May 1971; James Patterson et al, U.S. Patent No. 3,632,496, Jan. 1972. See also Barbara Goss Levi, "Light travels more slowly through strongly scattering materials," Physics Today, June 1991, p. 17-19. Light total transit time through the materials is increased, but between reflections it travels at c. The Poynting energy flow, however, endures longer in these materials, and so the electron reaction time (i.e., energy collection time) is increased. The Shoulders cluster overunity patent may also utilize this enhanced energy collection via increased transit time due to iterative retroreflections of the Poynting energy flow, and also may utilize a weak quantum potential effect. E.g., see D.D. Davis and S.C. Mettler, "Experimental investigation of the fiber fuse," Summaries of Papers Presented at the Conference on Optical Fiber Communication, Vol. 8 1995 Technical Digest Series, Postconference Edition, 1995, p. 187-188; D.P. Hand and P. St. J. Russell, "Solitary thermal shock-waves and optical damage in optical fibers," IEE Colloquium on 'Non-Linear Optical Waveguides', IEE Digest No. 88, London, England, 1988, p. 101-3; ____ "Soliton-like thermal shock-waves in optical fibres: origin of periodic damage tracks," Fourteenth European Conference on Optical Communication (ECOC 1988), Sep. 11-15, 1988, Publication No. 292, 1(2), 1988, p. 111-114; ____ "Solitary thermal shock waves and optical damage in optical fibers: the fiber fuse," Optics Letters, 13(9), Sept. 1988, p. 767-769; P. St. J. Russell and D.P. Hand; "Solitary thermal shock waves and optical damage in optical fibers: the fiber fuse," Optics Letters, 13(9), Sept. 1988, p. 767-769; D.P. Hand and T.A. Birks, "Single-mode tapers as 'fibre fuse' damage circuit-breakers," Electronics Letters, 25(1), Jan. 5, 1989, p. 33-34. For a very good lay description with photographs, see Ivars Peterson, "Fibers With Flare," Science News, 140(13), Sept. 28, 1991, p. 200-201. Excess emission from a medium has been known for a long time, but not much has been done with it until the work of Letokhov and the work and inventions of Lawandy. E.g., we quote from H.C. Dake and Jack DeMent. (1941) Fluorescent Light and Its Applications, Chemical Publishing Company, Inc., Brooklyn, New York, 1941. p. 51-52: "When a phosphor or other luminescent substance emits light, it gives in most cases an emission according to Stokes' Law. This law states that the wavelength of the fluorescent (emitted) light is always greater than the wavelength of the exciting radiation. It was first observed in 1852 in the memoir "On the Change of Refrangibility of Light," by Sir G.G. Stokes. In terms of energy the relationship states that e em < e ab. While Stokes' Law holds for the majority of cases, it does not hold in certain instances. In some cases the wave length is the same for both the absorbed and the emitted radiation. That is, the efficiency appears to be perfect or unity. This is known as resonance radiation. In other cases Stokes' Law does not hold where the energy emitted is greater than the energy absorbed. This is known as Anti-Stokes emission. In 1935 Prileshajewa showed that there is an energy difference as much as 1.1 v between the exciting light and the fluorescence of aniline vapor. 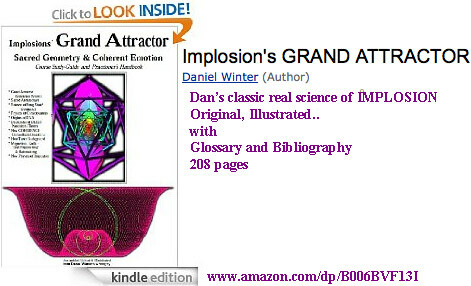 This added energy is attributed to additions from the internal energy of the molecule." However, when the active medium produces excess energy emission, and continues to do so, then the added energy cannot be attributed to additions from the internal energy of the molecule, unless the internal energy of the molecule is itself continually being replaced from -- you guessed it -- the vacuum's fierce interaction with the molecule's charges. Further, the dynamic dipoles comprising the molecule or the particle/liquid boundary, can produce double-surface E-fields of large magnitude, as is well-known in electrochemistry. Multipass retroreflection between TiO2 particles (Lawandy) or between palladium-clad, charged beads (Patterson) can collect and disperse (as scattered coherent photons) additional energy from the powerful S-flows of the double-surface Poynting generators. It follows that, by "doctoring" anti-Stokes radiation situations so as to allow multipass retroreflection and thus multicollection, a permissible overunity process emerges that is practical. It is also one which can be developed into commercial overunity and even self-energizing power sources. See David J. Bohm, "A Suggested Interpretation of the Quantum Theory in Terms of 'Hidden' Variables, I and II," Physical Review, 85(2), Jan. 15, 1952, p. 166-179 (Part I); 189-193 (Part II); ___ "Hidden Variables and the Implicate Order," Quantum Implications: Essays in Honour of David Bohm, Eds. B.J. Hiley and F. David Peat, Routledge & Kegan Paul, London, p. 33. See also D.J. Bohm and B.J. Hiley, "On the Intuitive Understanding of Nonlocality as Implied by Quantum Theory," Foundations of Physics, 5(1), March 1975, p. 93-109; ____ "The de Broglie Pilot Wave Theory and the Further Development of New Insights Arising Out of It," Foundations of Physics, 12(10), 1982, p. 1001-1016; ___ "Unbroken Quantum Realism, from Microscopic to Macroscopic Levels," Physical Review Letters, Vol. 55, 1985, p. 2511-2514. See particularly B.J. Hiley and F. David Peat, Eds., Quantum Implications: Essays in Honour of David Bohm, Routledge & Kegan Paul, London, 1987, reprinted in 1988. For simplicity I have referred to this "excess radiation by the medium" as the Letokhov-Lawandy Effect. However, it is an application of anti-Stokes emission, as we noted earlier. Lawandy is not the original discoverer of anti-Stokes emission, and there is a background of work in the area preceding Lawandy's own important new research and patents. E.g., see V.S. Letokhov, "Generation of light by a scattering medium with negative resonance absorption," Soviet Physics JETP, 26(4), Apr. 1968, p. 835-839. What Lawandy has done, of course, is to provide a rather brilliant and practical extension and development, building on the basic anti-Stokes effect, and adding a highly effective means of initiating multipass energy collection, which yields permissible overunity. We particularly stress that Letokhov's term, "negative absorption" (which has been adopted in the field) is just a euphemism for "excess emission." Translate this to "negative energy absorption" and then to "excess energy emission," and one can see why one might prefer to use the term "negative absorption" when filing a patent application with the U.S. Patent and Trademark Office, rather than directly filing on the true overunity process one has developed!